In 2012, PSAA was founded as an advocacy group. Our friends were being pressured and harassed by the police for making art in the street, even when they had permission from owners. Art shows and galleries that supported street and graffiti art were being shut down. 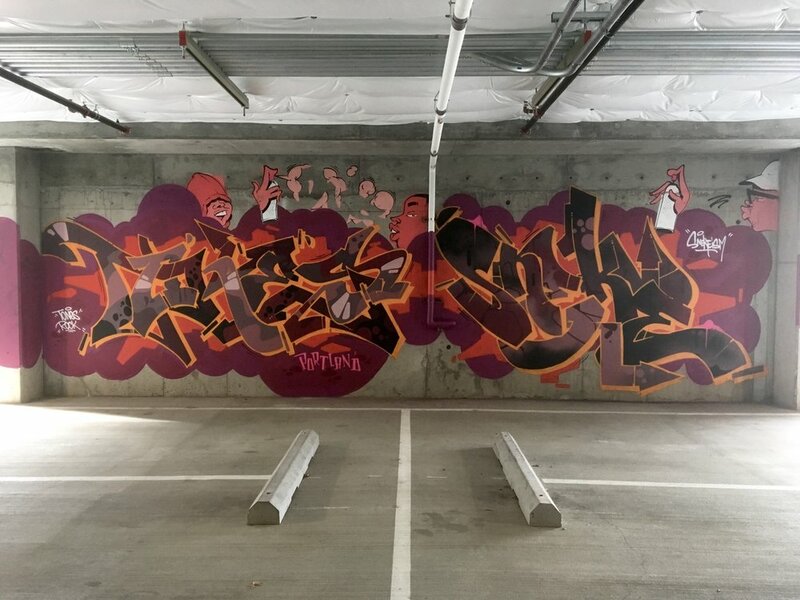 Since then, PSAA has been working behind-the-scenes to help advocate for this form of art and shape the future of street and graffiti art in Portland by advocating for new City policies. This year, PSAA is working in a collaboration with Portland State University’s Urban Planning Department to develop a Legal Walls proposal to go before the Portland Council for city-wide approval. PSAA was one of a few organizations selected (including the Portland Bureau of Transportation, the City of Vancouver, the City of Monroe, and the Cathedral Park Neighborhood Association) by the department’s Master’s student senior workshop to participate in this initiative. Working closely with PSAA, a team of students will craft a proposal to advance the City’s policies surrounding street murals and public art for the collective empowerment of Portland’s street artist community, drawing on street art best practices and case studies from around the world. 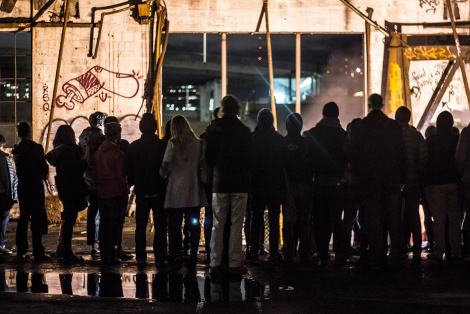 The proposal will combine research, original data collection, and analysis to present policy alternatives allowing Portland to better leverage its thriving street arts culture and solidify the City’s identity as a haven for creatives. By listening to stories from artists and free wall organizers from around the world, and working with policymakers, property owners, and other stakeholders, this team will co-develop recommendations supporting street art’s potential to achieve City-wide district revitalization goals and use art as a means to include the voices and perspectives of historically marginalized communities. The final proposal will be available in summer 2019. 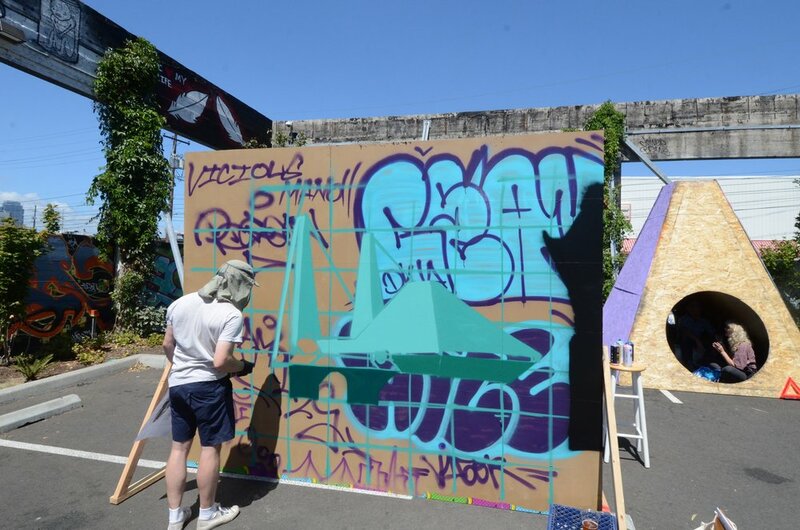 To remain updated on the process, add your input, and lend your support for City Council approval, join the PSAA community list and TAKE THE SURVEY to let us know what you think about possible effects of and need for free walls in Portland. We want to hear from you! Read more about free and legal walls. 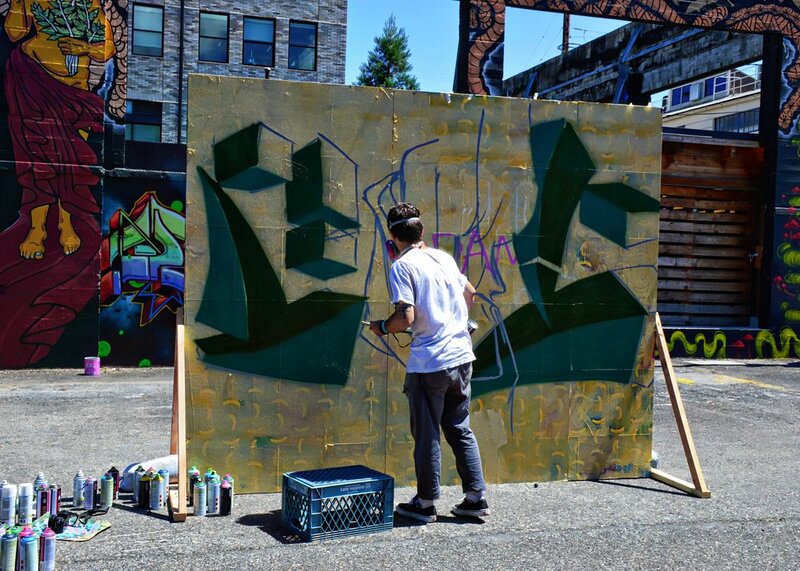 Read more about the history of zero-tolerance graffiti policies in Portland. Join us for a live art installation and dynamic conversation around the role of public art as a vital part of our evolving city. Our built environment is a canvas for artistic expression providing opportunities for artists that extend beyond the confines of gallery walls. How can we advocate for and broaden not only the understanding of public art, but the city’s expansive creative capacity and its potential to impact the cultural vibrancy of Portland? 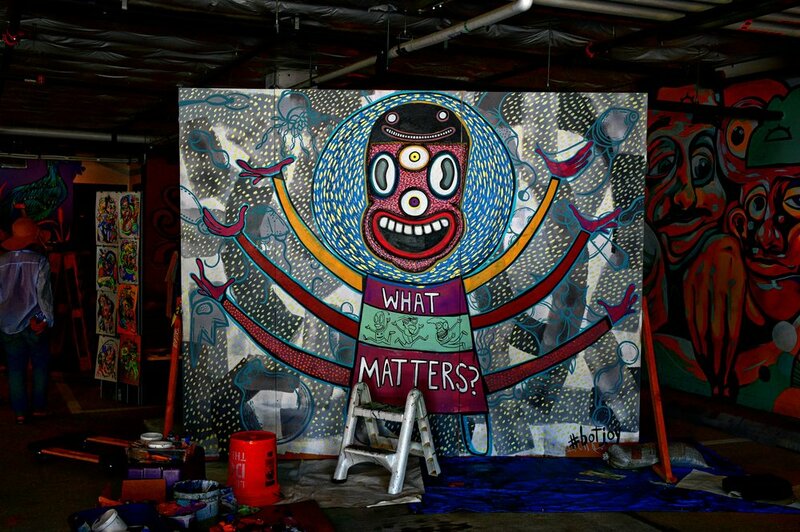 As individual property owners, real estate developers, government entities, community members and civic leaders incorporate the artistic community as active participants in a dynamic city, what is the role of public discourse and community engagement? In this changing landscape where urban planning, business objectives and artistic expression intersect, what are the challenges and opportunities for meaningful change? How does one interpret beauty, cultural aesthetics and new art forms in public spaces? How do we celebrate the public art that currently exists or the experimental spaces and communities that are emerging? Where are the crossroads for public/private and city-wide collaboration? Huge thank you to our friends at Killian Pacific for hosting this event. Thank you to the beverage sponsors: Union Wine Co., Dirty Pretty Brewing & Brew Dr. Kombucha. 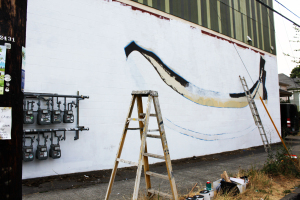 The Portland Street Art Alliance has been awarded an Oregon Community Foundation Creative Heights in support of the new Viaduct Arts: Central Eastside Mural Art Program. For the fifth consecutive year, Creative Heights grants fund a variety of artists and cultural projects throughout the state. Each year, OCF provides Creative Heights Grants to up to 12 of the most innovative and culturally impactful proposals by artists and groups across Oregon. 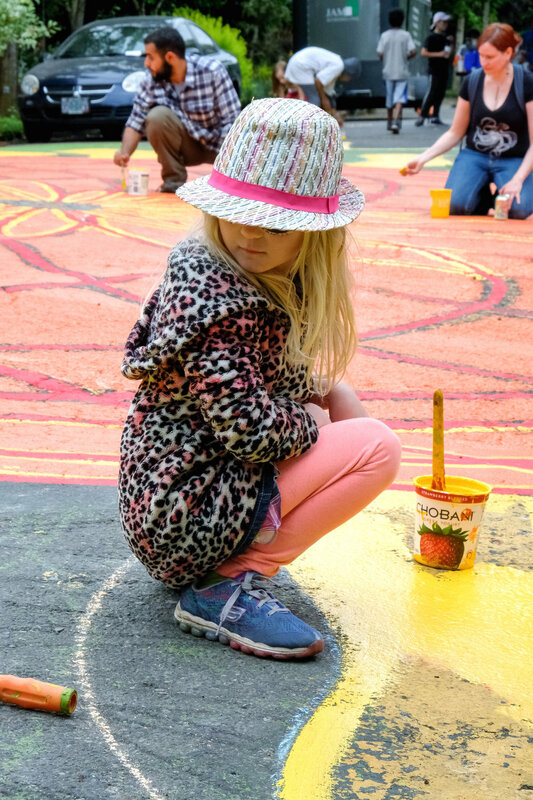 Support from OCF and generous donors expand opportunities for many of Oregon’s art communities to create work that advances the state’s artistic and cultural fields and engages traditionally underserved audiences. PSAA is truly honored to be a 2018 grant precipitant. Read more about Creative Heights and other exciting grant recipient projects here. 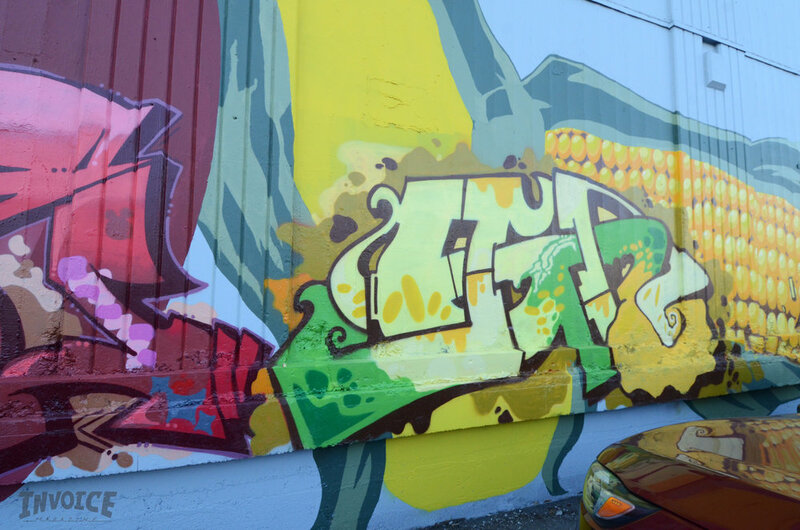 Viaduct Arts will support emerging artists from across Oregon in painting vibrant art murals in the heart of the Central Eastside Industrial District (CEID) of Portland in the Spring/Summer 2019. 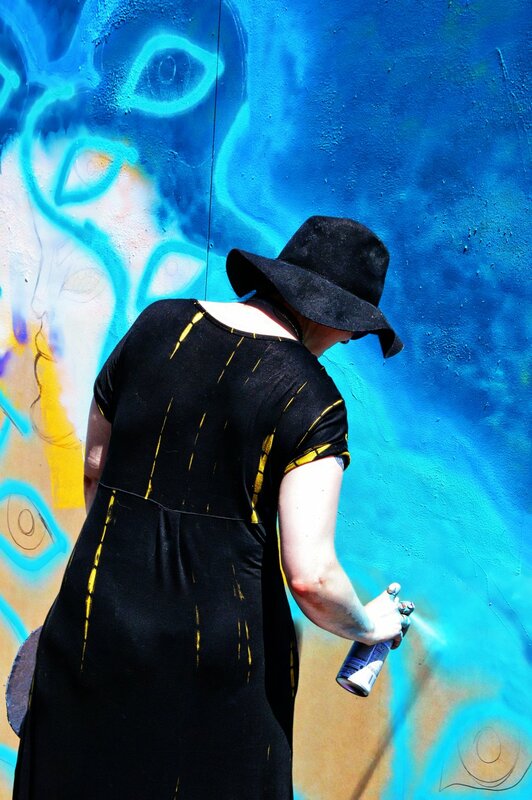 Three established Portland street artists along with emerging artists from around Oregon will pair and take new risks to develop their public practice and skill-sets, build their connections, and promote more inclusive engagement and access to public art-making in the city. Drawing inspiration from the district’s acronym CEID, this new program is intended to seed art making as an integral part of the district’s identity as a hub for innovation and culture building. Street art can enrich everyday life, help build a city's identity, build bridges, and foster a sense of place and pride in our community. 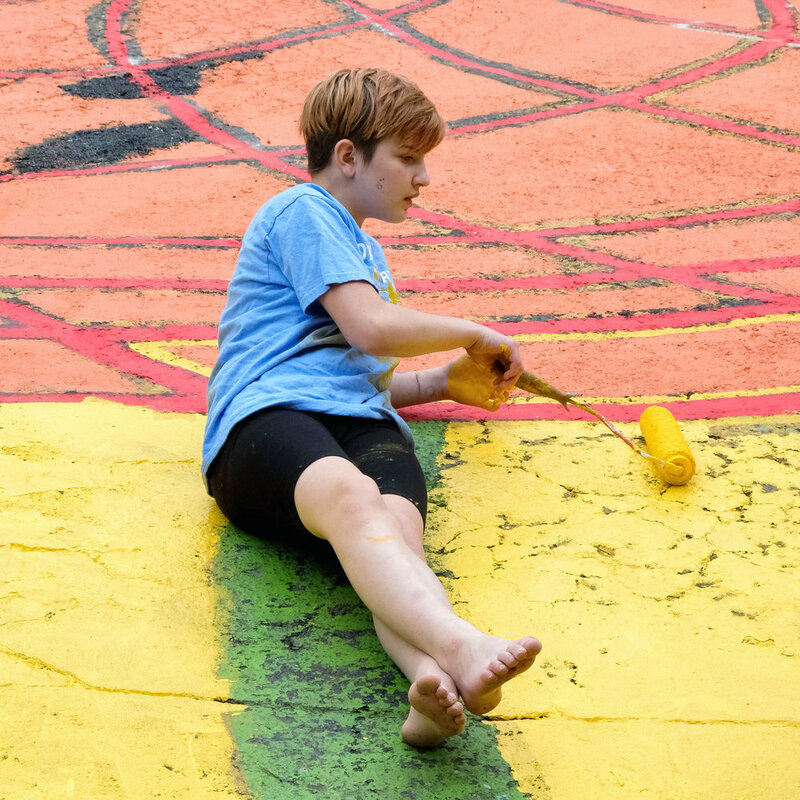 PSAA is dedicated to creating inclusive models for place and district-making by engaging diverse audiences and artists, and increasing access to public art opportunities, while seeding a new generation of emerging artists. 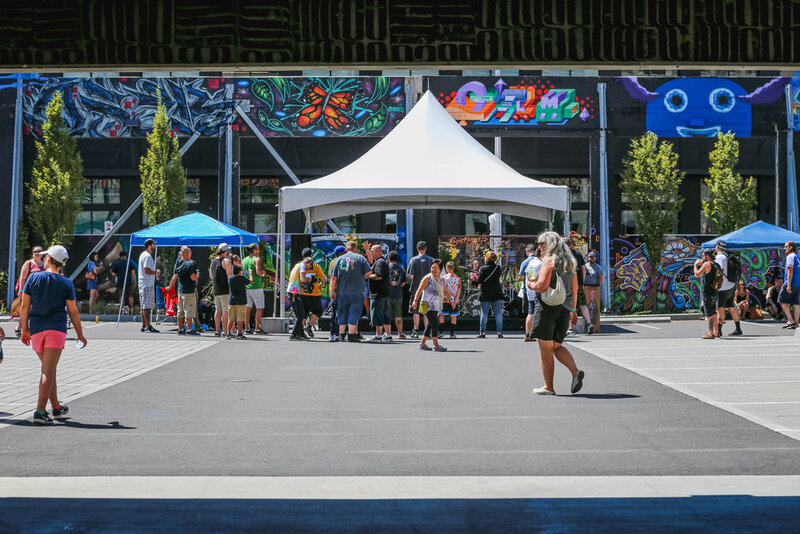 Making strong visual use of under utilized spaces within the Central Eastside Industrial District increases alliance building and grassroots community engagement. 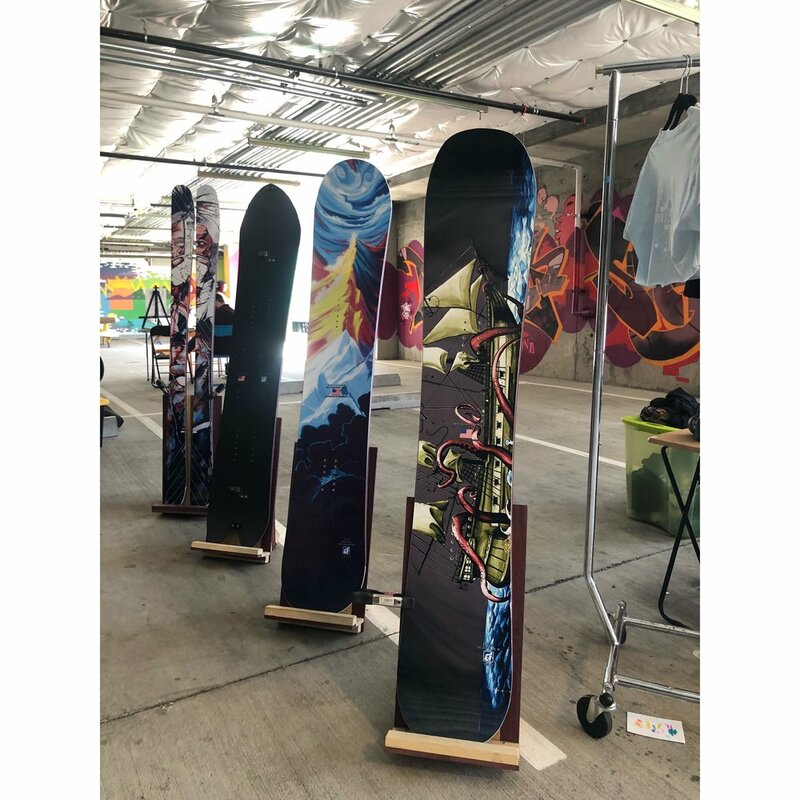 As a model for alliance building and grassroots involvement within the street art and business community, PSAA has garnered support from vital partners for this project. The district-wide project will be coordinated in collaboration with the Central Eastside Industrial Council, Regional Arts & Culture Council, City of Portland's Office of Community & Civic Life's Graffiti Program, and most importantly local businesses and property owners. Viaduct Arts brings together artists to build technical skills, and access support and resources, while pushing their creative boundaries. Each participating artist is expected to hone skills that will support their increased ability to engage within their respective communities to seed arts across Oregon. 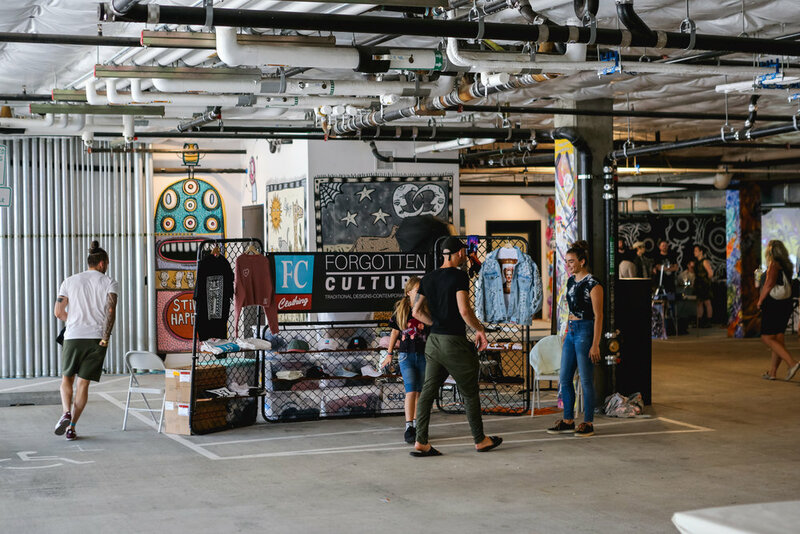 Portland is experiencing accelerated redevelopment and demographic changes, increasing the urgency for creation of spaces that welcome artists from across the state to work, grow, and thrive! 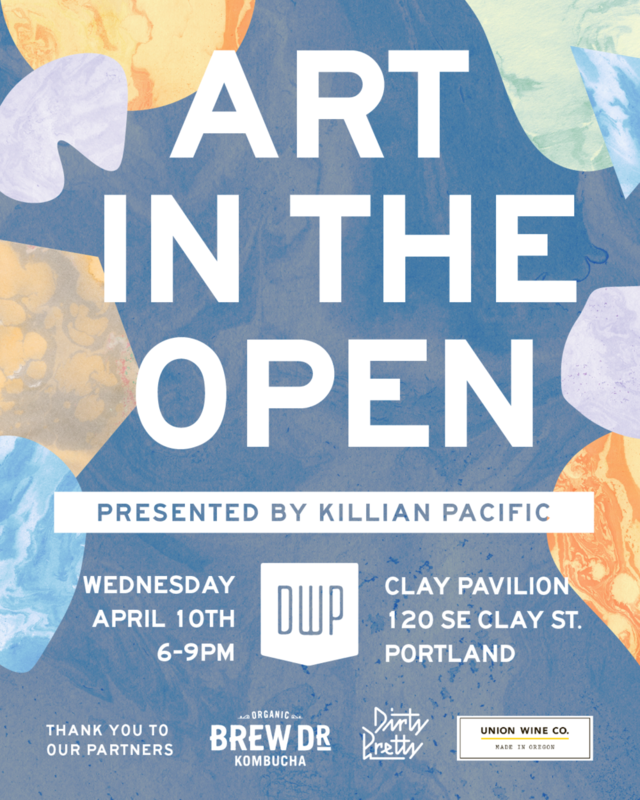 Emerging artists from underrepresented communities (BIPOC+, LGBTQ, Women, Disabled, Low SES), specifically those living across Oregon outside of the Portland metro area are particularly targeted for participation. Central to the success of this project is establishment of new connections for diverse artists to push their creative limits and make their voices heard in urban public spaces. How can you help? Consider making a tax-deductible donation to support this new program! The secured grant funding covers artist and management time, but support is needed from business and property owners to help pay for additional paint and supplies. DO YOU HAVE a Wall? Volunteer, Help us make this happen! PSAA is a volunteer run organization. Many of the public art projects we do depend on the community coming together to make them happen! Please fill out the Volunteer Interest Form below to get involved. LIVE PAINTING, INTERACTIVE ART INSTALLATIONS, LIVE MUSIC, DANCE BATTLES, ART VENDING, DJS, FOOD CARTS, LOCAL CRAFT BEER, COCKTAILS, AND MORE! 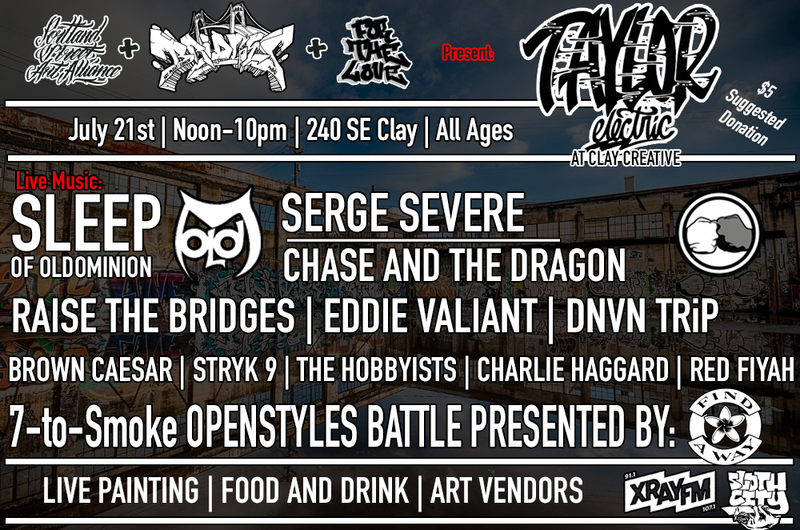 The Portland Street Art Alliance has launched the Taylor Electric Project at Clay Creative, a collaborative, open-air street art gallery that features the work of over 100 artists. 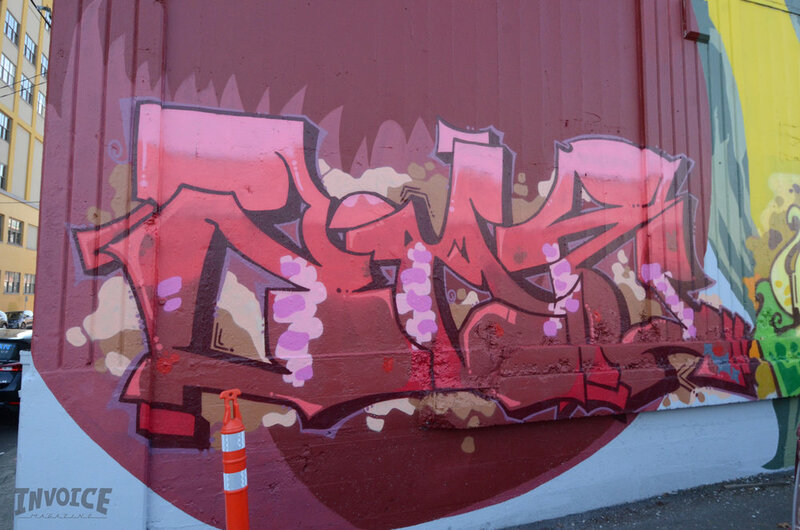 For over a decade, the ruins of the Taylor Electrical Supply Company, located on 240 SE Clay St., became a Portland nexus of local, regional, and national graffiti and street art following a fire that left only the burnt-out husk of walls, a perfect canvas for street art within Portland’s ever-changing Central Eastside District. 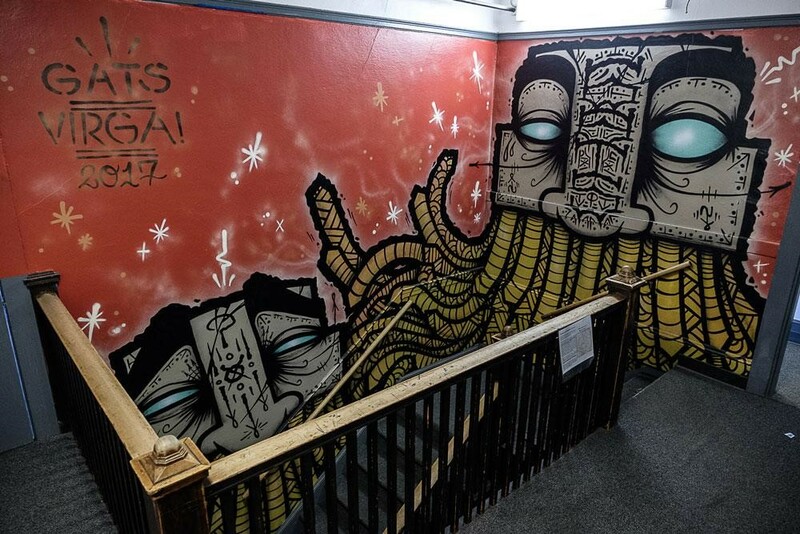 In 2015, what remained of the building was demolished but with the support of Killian Pacific, Portland Street Art Alliance is collectively rebuilding the Taylor Electric Project into a haven for street art once again. 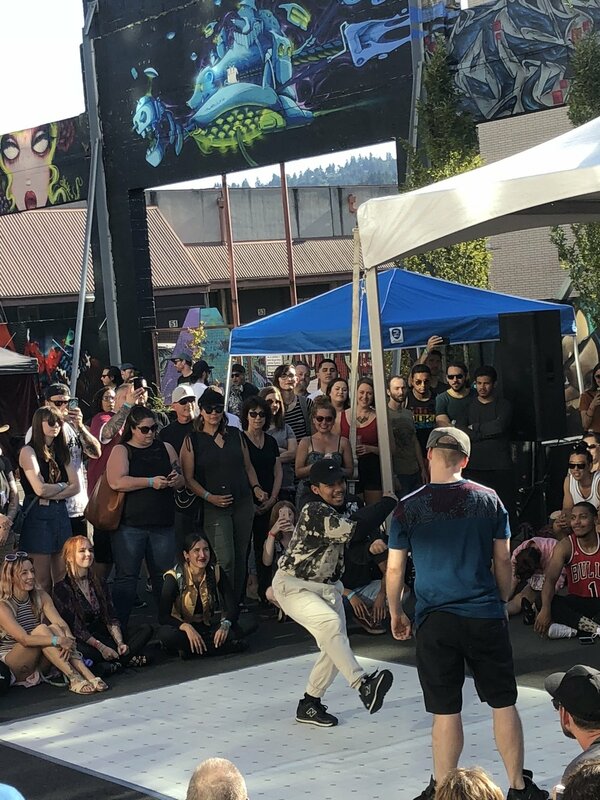 In July 2018, Portland Street Art Alliance co-hosted an all-day all-ages event that included live-paintings, artist commissions, live music, a dance battle, local pop-ups, food carts, local beer, skateboarding ramps, and more. Over 2,000 members from the community came out to celebrate this new chapter in Taylor Electric's history. Huge thanks to all the event staff, volunteers, and artists for making this event happen! It was a true community-driven event in every sense. © All photos copyright of credited owner. Do not use without permission. For over a decade, the burnt-out ruins at SE 2nd and Clay served as Portland's most famous space for graffiti– a free open art gallery that attracted artists and onlooks from near and far. 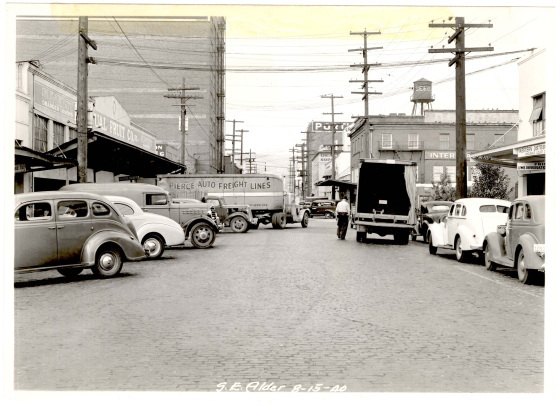 Built in 1936 by the Loggers & Lumberman’s Investment Company, the warehouse at 240 SE Clay (previously 352 E Clay St) served as a home to many different businesses through its lifetime at its picturesque location at the east-end of the Central Eastside Industrial District. In the 1990s, the Rexel Taylor Electrical Supply Company purchased the building and used it as a storefront and warehouse for electrical supplies. On the night of May 17, 2006, a stack of pallets outside the building caught fire. Fueled by the electrical supplies inside, a massive 4-alarm fire broke out. Over 125 fire-fighters from Portland and nearby cities worked around the clock trying to extinguish the blaze and protect nearby buildings. Burning for over 24 hours, the fire sent a river of debris into the nearby Willamette River. Taylor Electrical Supply had plans to rebuild and sell the property, but that fell through, so the charred skeleton of the warehouse sat abandoned for over a decade. The ruins blossomed into a unique and iconic local landmark - a sanctuary for artists, rebels, and outcasts. When people visited Portland and wanted to see graffiti, Taylor Electric was an obvious and easily accessible destination. Cultural activities from dances, circuses, and bicycle chariot wars used Taylor Electric as a gritty stage and backdrop. In many booming west coast cities, space for unanticipated interactions and unauthorized art are rapidly diminishing. However, these derelict spaces serve important functions for many creatives. 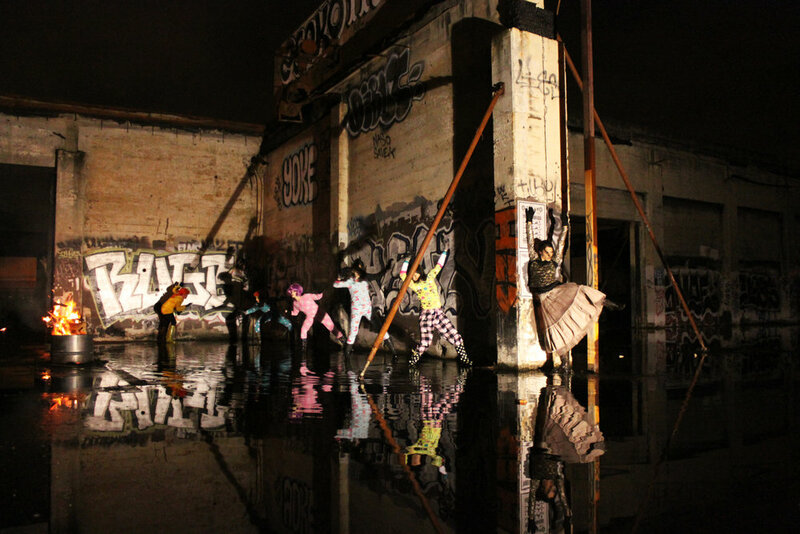 Artists are often some of the first to find, occupy, and re-use dilapidated spaces. These cracks of the urban fabric fall outside the watchful eye of neighbors and police. Rumors of demolition and redevelopment plans of Taylor Electric had been circulating for years. With Portland’s booming economy and population this change was inevitable. As power and urban space collide, developers inevitably would redevelop this centrally located property. A family-owned local development company, Killian Pacific eventually purchased the property intending to develop it into a new office campus called Clay Creative. Thankfully, Killian Pacific appreciated the cultural history and raw beauty of the space and decided to preserve and reinforce part of the old south-facing retaining wall, incorporating it into the new building. In the months leading up to its demise, the art at Taylor Electric flourished as the fences went down and security was reduced. More so than ever people of all types, young and old, high heels and rubber boots, descended on this public place to experience a post-apocalyptic scene bursting with color. On May 10th, 2015 the demolition of Taylor Electric began. Spreading quickly through social media, artists shared images of the first walls to fall. Some onlookers talked with workers, gathering details of the plans. Local media outlets covered the demolition, focusing on the cultural importance and impact of this space. While a sense of loss pervaded, there was also a sense of unity and reflection that arose, as many people began to introspectively think about what was being lost, but also what had been built over the years in this space. 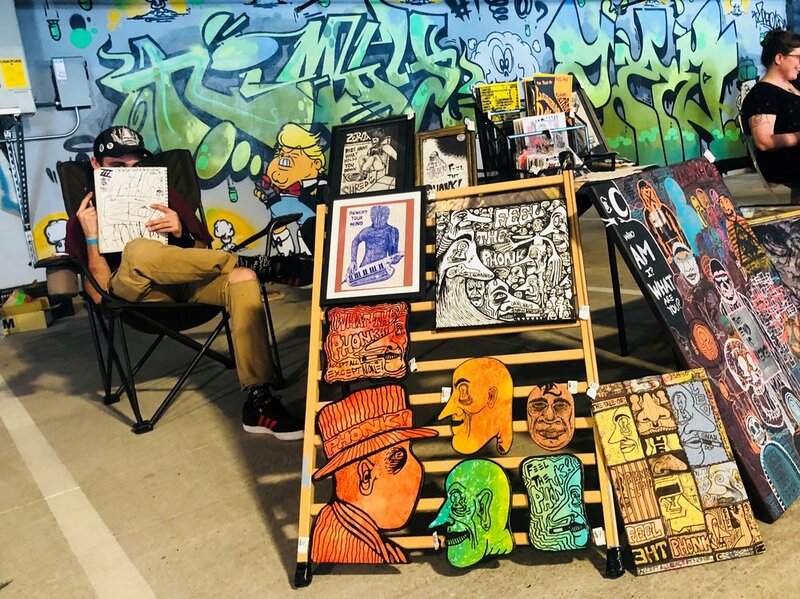 During this time, the Portland Street Art Alliance (PSAA), a local arts non-profit that advocates for and manages street art projects in the pacific northwest, started pitching the ideas of hosting a gallery art show in commemoration of the old space. Donations immediately started coming in from community members and businesses. PSAA connected with Killian Pacific and the main tenant of the building, Simple Bank. From these new partnerships, a new idea was born – bring graffiti art back to the site, but this time, provide artists time, structure, and funding to really make a huge splash. The collective aim was to honor and continue the history of this unique art sanctuary. To create a new rotating public art gallery displaying fresh works from pacific-northwest and visiting artists. Since 2017, the Taylor Electric Project at Clay Creative has been managed by PSAA with support of local businesses. 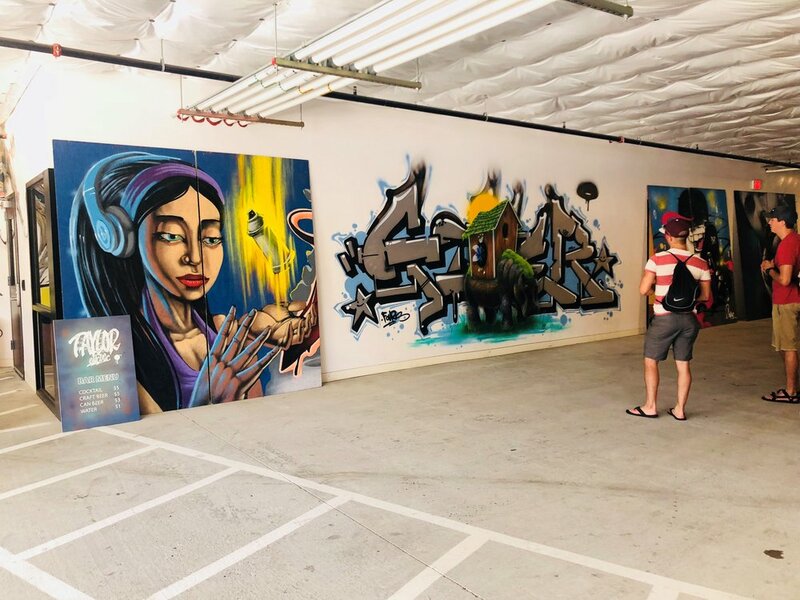 Over 100 regional artists have painted murals at the site, completely covering the underground garage and old remaining walls of the warehouse. 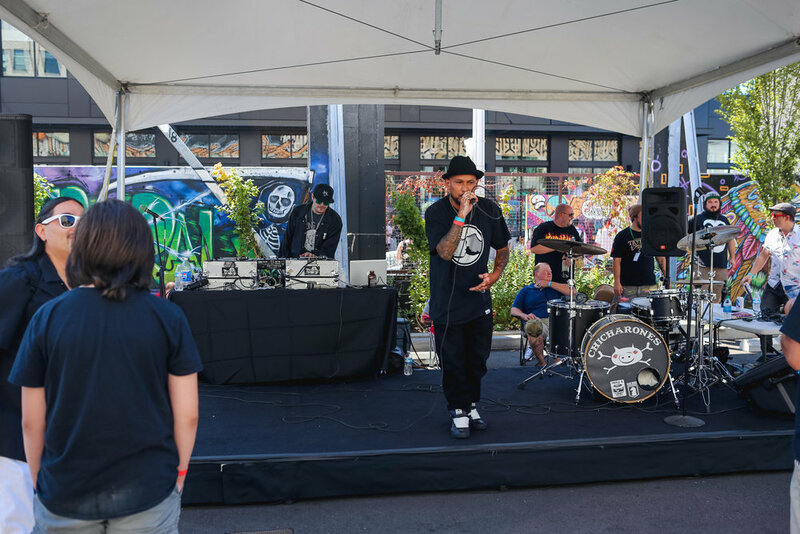 On July 21st, 2018, PSAA organized a team of Portland-based artist collectives to co-host a huge block party. Over 2,000 people came to celebrate the completion of the new murals. 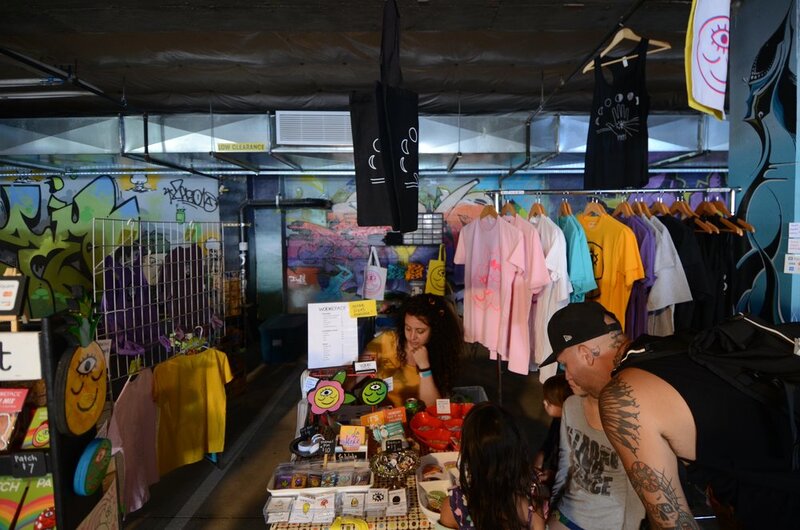 The block party had live painting by over 20 artists, live bands, a dance battle organized by Find a Way, a pop-up skate park erected by D-Block, kids activities, a food and beer garden, and an art fair in the garage where local artists sold merchandise and did live screen printing. 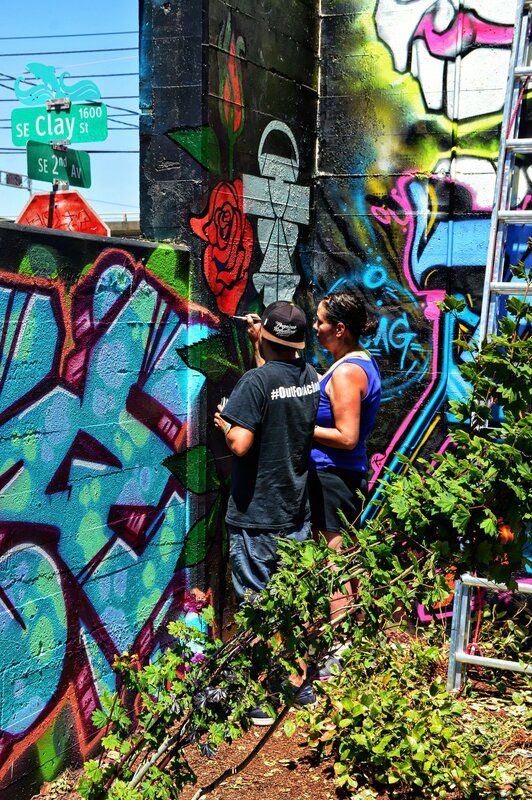 Portland Street Art Alliance plans to make this an annual block party event that brings together artists from around the pacific northwest to celebrate and further seed art into the Central Eastside Industrial District and the City of Portland. Working in partnership with Killian Pacific and Simple Bank, PSAA has managed several interior office mural at Clay Creative, with plans for more. The aim is to provide local artists access to commission opportunities, and provide workers with an inspiring everyday environment to be in, in the heart of Portland’s Central Eastside Industrial District. 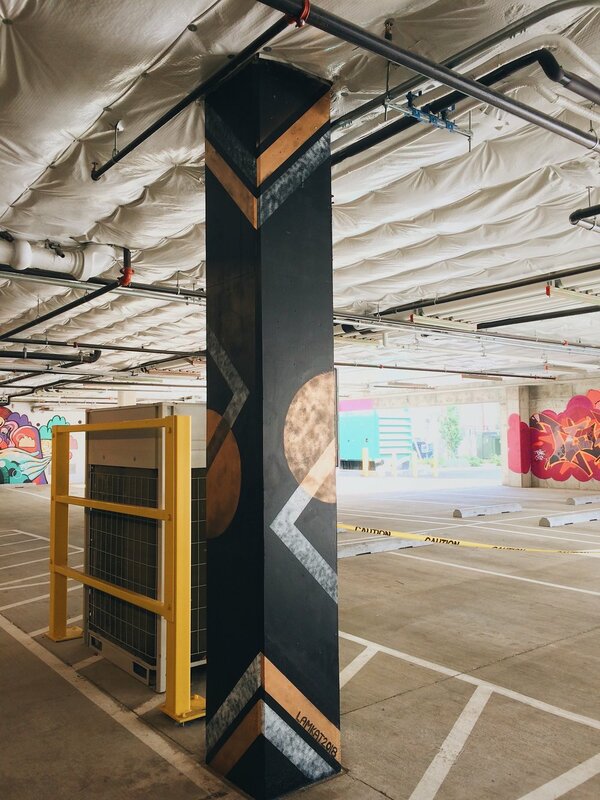 In 2017, PSAA began organizing rotating painting inside the parking garage at Clay Creative. All garage murals are done on a volunteer basis by both PSAA and participating artists. These walls provide much needed space to build portfolios, experiment with new designs, and painting techiques. Please consider volunteering, vending, donating, or sponsoring the next event. All of the management team donates their time up front, works together, and makes this all happen! Contributions are tax-deductable. 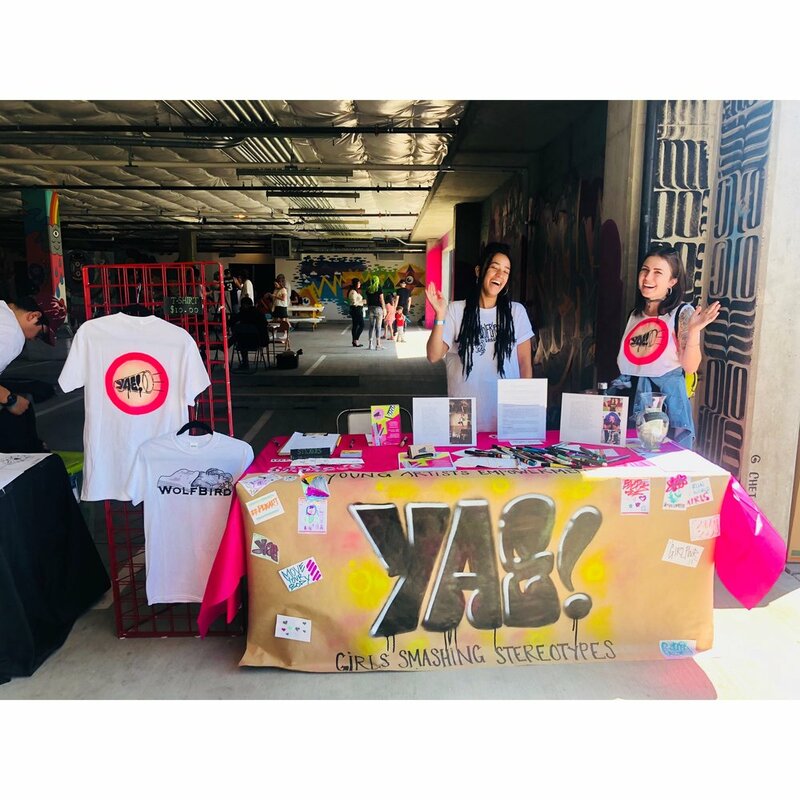 YAE Camp is a partnership between several female-directed nonprofits and collectives; Portland Street Art Alliance, WolfBird Dance, and Graffiti Camp for Girls. The second annual YAE Camp will hit Portland streets in August 2019! YAE Camp 2019 will be 2-weeks of immersive experiences designed to build the confidence and provide mentorship for middle-school aged female/femme/non-binary youth. Participants who come from diverse, historically marginalized communities, and under-served low-income homes in Portland will be provided scholarships to attend. Most youth come to camp with no previous experience with spray painting or dancing. They make mistakes and learn new skills together. By the end of camp, campers will have completed a mural they designed and participate in a dance performance they choreographed. In the morning, they learn fundamental skills necessary to create a mural. They are guided through the process, focusing on how to collaborate and cooperate with one another, supporting the development of each other’s skills. They receive lessons in letter-making, drawing, composition, aerosol painting techniques, and safety. Mentors provide creative counsel, assistance with designing, an understanding of tools, and tips on how to seek permission. Campers are also encouraged to take risks and reach beyond what they’re comfortable with. They can contribute their ideas and will be encouraged to support each other in executing their ideas. In the afternoon dance component, youth explore how freestyle and hip-hop can provide empowerment, healing, and comfort in one’s own body. Youth are taught the fundamentals of different styles of hip-hop dancing. They are also provided the tools and understanding of how to develop their own freestyle voice and what techniques to use in a dance “battle.” On the final day of camp, youth perform their choreography and participated in a final all-female dance battle that is attended by family, friends, and the larger community. During YAE Camp, youth are also provided mini workshops to learn about the history and pillars of hip-hop culture including freedom of expression in public space, rhythmic poetry, blending melodies using a turntable, and breakdancing. Several local guest speakers (many of whom are females) come spend time with the campers, to share their art forms, professional work, and life experiences. 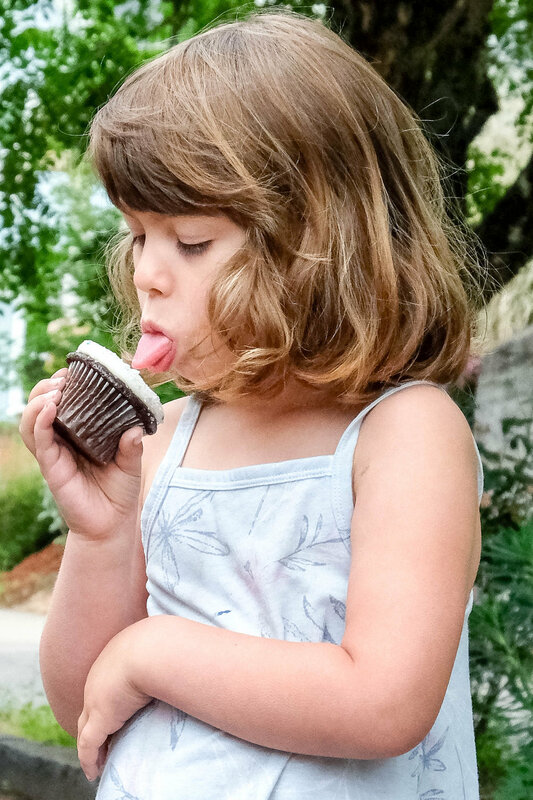 These interactions provide an opportunity for the girls to communicate with role models in the community in a comfortable, active, and non-authoritative setting. 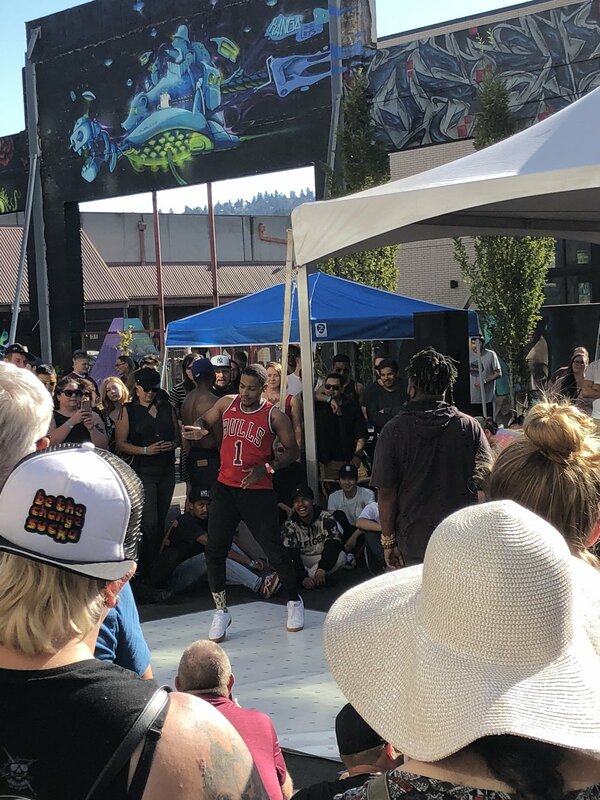 In August 2018, Portland Street Art Alliance and WolfBird Dance hosted the first annual one-week summer camp for female-identifying youth ages 11-14. YAE! Young Artists Empowerment Camp was held at Clay Creative in the Central Eastside Industrial District of Portland. This program provides youth a platform to develop their artistic voices and find empowerment through art and dance. During the two-week camp, ten youth from diverse communities across Portland were provided street art and street dance training, accompanied by workshops to learn about the pillars of hip hop and the history and background of this culture: Graffiti (freedom of expression in public space), MC-ing (rhythmic poetry, aka rapping), DJ-ing (artfully blending melodies using a turntable), Breakdancing (a highly expressive style of street dancing), and Knowledge (skills and community building). We dove deep into the fundamentals of hip-hop dance, focusing on free-styling techniques, battling tactics, and how to learn and remember choreographed patterns. They also received lessons in letter-making, drawing, aerosol painting techniques, mural composition, and paint safety. YAE! Camp provides young women a platform to feel empowered and become creative, productive, and confident members of our community. YAE! Camp offered instruction from an eclectic staff of dancers and artists to display diversity in all forms of artistic professionalism. We brought guest speakers throughout the week to talk about their art and other programs happening in Portland, also lead by women. 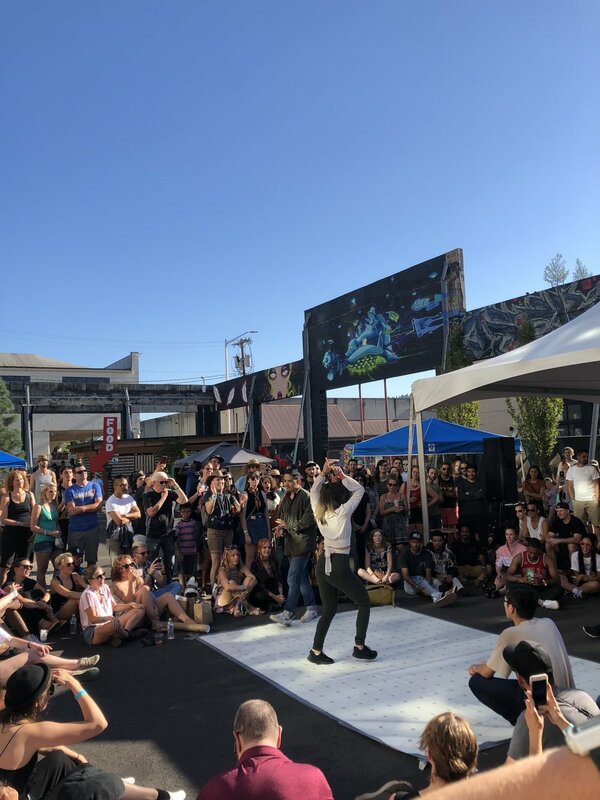 With the culmination of this camp, students worked together to create a choreographed dance, participate in an all female dance battle, and collaborate on the development of four different murals (one of which is still on display to the public at 420 SE Clay St in Portland). Our students presented these performances and murals at our final YAE! Camp wrap party, closing out the program with an opportunity for our young artists to show off their new skills to friends, family, and the community. In the mornings, camp participants were guided by mentors from WolfBird Dance to explore how freestyle and hip-hop can provide empowerment, healing, and comfort in one’s own body. With the support of five main dance camp mentors, we taught the fundamentals of different styles of hip hop such as Krump, Wacking, and popping. 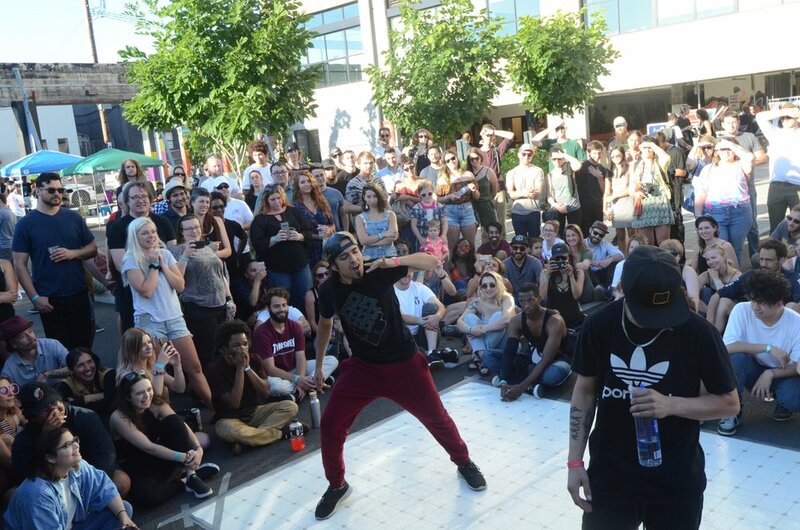 We also provided the tools and understanding of how to develop your own freestyle voice and what techniques to use in a battle, while simultaneously teaching the importance of how to learn and retain hip hop technique and choreography. On the final day of YAE! Camp, our ten campers performed their choreography and participated in a final all-female dance battle. The afternoon session was led by members of the Portland Street Art Alliance. 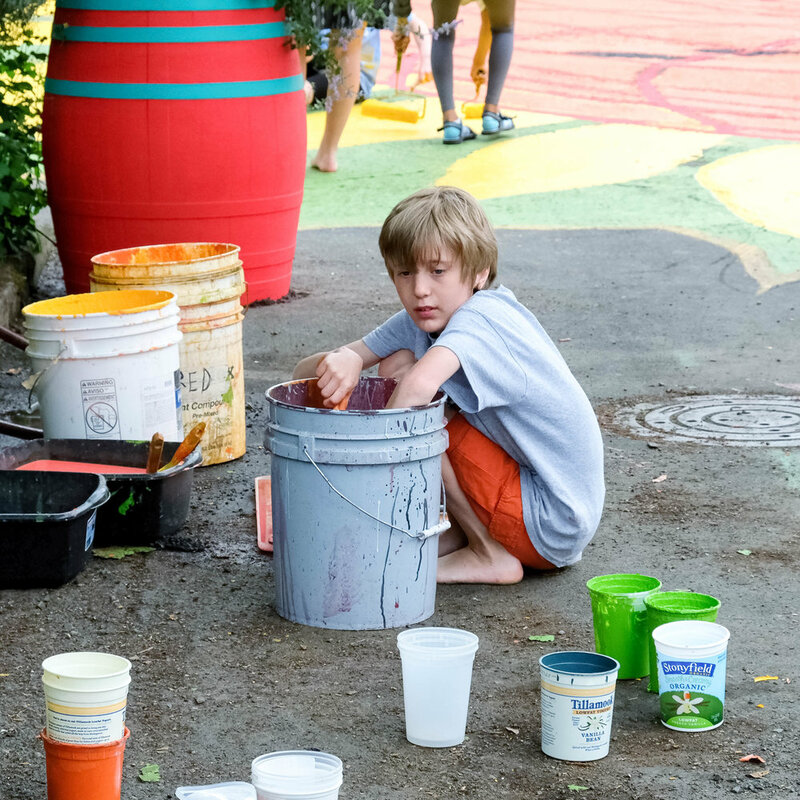 Campers were guided through the entire process of creating a mural, including visualizing, sketching, and painting with aerosol and brush basic techniques. They were provided both one-on-one and group lessons with PSAA’s mentors. The final collaborative YAE! 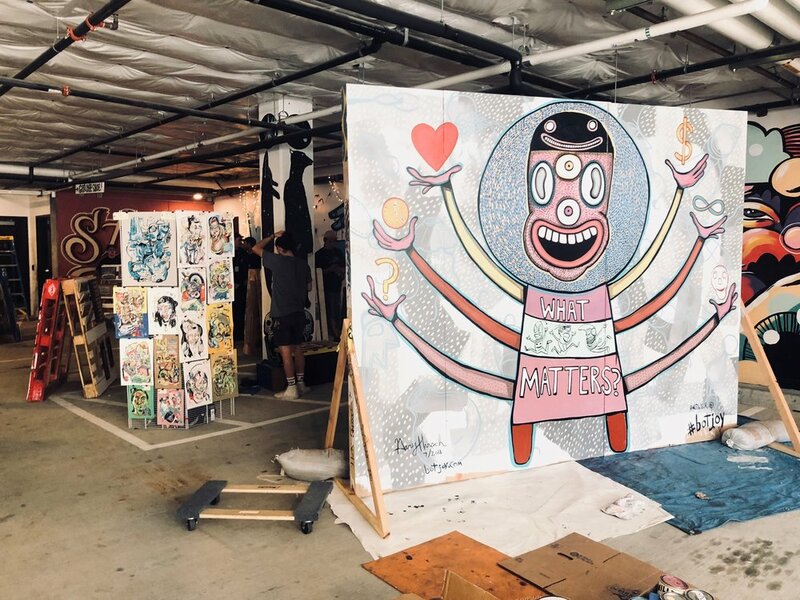 Camp Mural is on-display in the garage of Clay Creative, now a part of the larger Taylor Electric Project, a historic site in the Central Eastside of Portland that provides rotating wall space for local artists. • DeAngelo Raines (Art Not Crime), who spoke about the history of graffiti and hip hop culture. 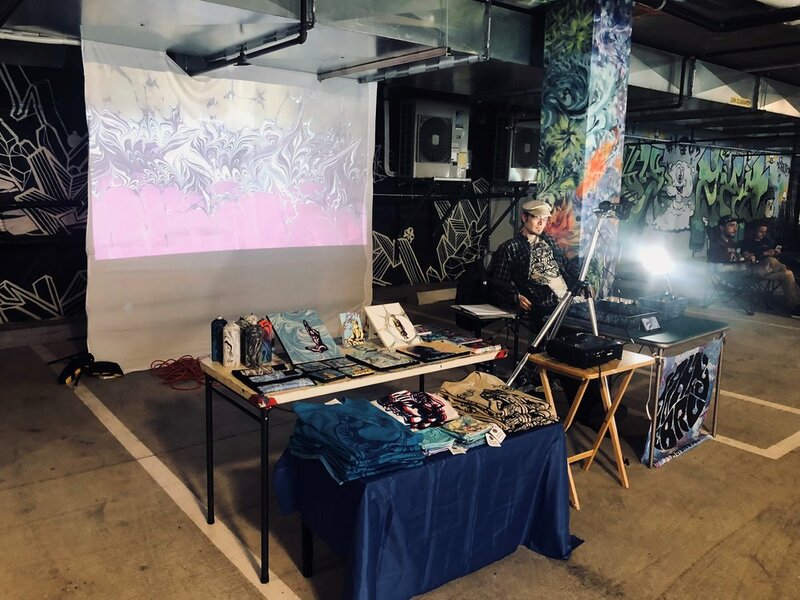 • Local female street artists, Wokeface (@wokeface), All the Veg (@alltheveg), and Flowering Jane (@flowering_jane), who showed the girls their work and the wide range of styles that street art can embody. • Local female DJ, Kaeli Hertz, who taught about mixing and turntable techniques as well as her experience in the industry. • Ella Marra-Ketalaar, a Community Engagement Coordinator at the Regional Arts & Culture Council. • Jesus Rodales (Find A Way), a local Portland dancer and activist encouraging cultural understanding of hip hop dance, who taught about the origins and history of street dance. • Daisy Lim, a dancer from New Zealand, who taught the fundamentals of Krump and how to use creativity and imagination to be a storyteller with movement. • Katie Janovec (The Aspire Project), a Portland based dancer who spoke about the fundamentals of popping. • Bao Pham (ADAPT), another Portland based dancer who demonstrated the possibilities of movement by combining many styles of hip hop, creating her own unique movement vocabulary. On the final day of YAE! Camp, we encouraged a “show and share,” an opportunity for the girls to share something unique about them, and a time for us as mentors, to encourage the girls to use this individuality in their art. Many students shared from their black books (YAE! Camp provided sketch books, for the girls to keep and practice in) their drawing styles. One student from Mongolia shared her new found passion for taking graffiti style lettering and transposing it onto Mongolian letters. Two other students taught us about traditional African and Mexican dance. They brought the oufits required for these dance styles and performed some of the dances for us. One student told us she now likes experimenting with incorporating traditional African dance moves into her freestyle practices. Camp was extended by two hours to invite friends, family, and the community to come see what we created and learned together. Students performed a choreographed dance, showing off their new moves and training on how to collaborate, move through space and remember choreography. 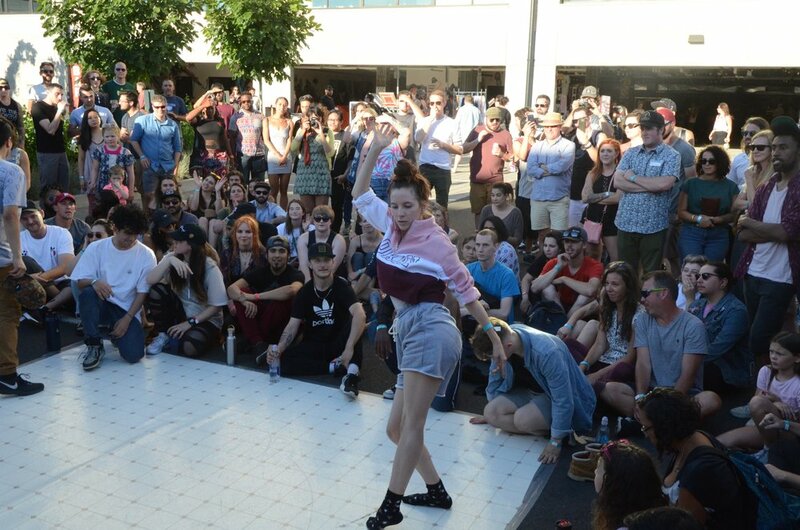 Their participation in an all-female dance battle, showed their knowledge of artistic choice in free-styling and freedom of expression through dance. We then presented their group murals. The teams presented why they chose their design, what it meant to them, and their favorite camp experiences. This event was not only an opportunity for our students to show their work, but also a chance for the community to see what we can be build when a safe space for learning and creativity is provided to young emerging artists. The response and support of YAE! Camp from our students, parents, and community was unbelievably humbling. During the wrap party, students also had the opportunity to provide camp organizers feedback on the week's activities. A short anonymous survey was distributed to the youth. Eight of the nine girls ‘strongly agreed’ that they liked YAE Camp and would want to attend again, with one girl saying they ‘agreed’ and would 'maybe' come back. The pilot YAE Camp was run by two volunteer non-profits. Now that we have proof of concept, we plan to apply for more grant support. 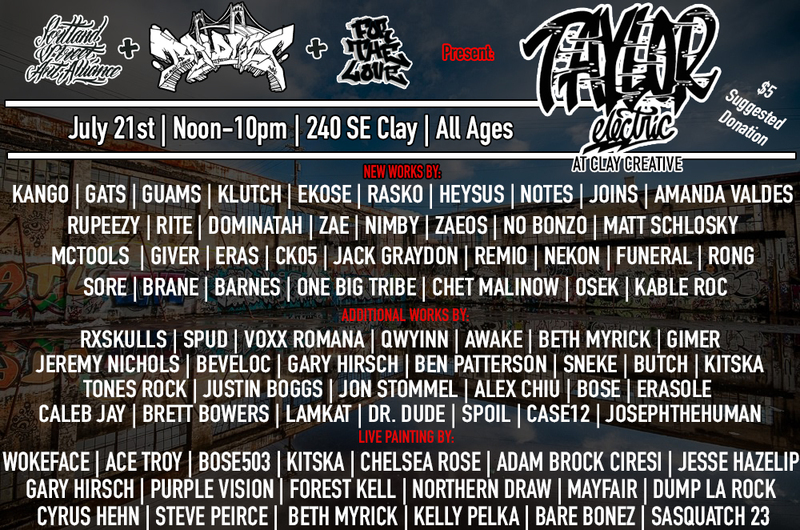 If you would like to volunteer to help us make this happen again, please email us at yaecamppdx@gmail.com. We need help with finding funding, writing grant proposals, securing donations, business sponsorships, and with camp logistics. The cost of the 10-day summer camp is $300 per student. This fee pays for instructor stipends, guest speakers, dance and painting supplies, and refreshments for the week and wrap party. Each year, we aim to raise money from local businesses and community members who can donate to this cause, so we can offer needs-based scholarship spaces. Our goal is to make the camp available everyone, including under-served and diverse youth from all around Portland. Please consider donating to this important program. All donations to YAE Camp are tax-deductible. Major sponsors will be acknowledged on the project website, AT THE EVENT, and IN SOCIAL MEDIA announcements. One of YAE! Camp’s main goals will always be providing affordable access to quality arts training. In its first year, we awarded seven 100% scholarships, one 75% scholarship, and one 50% scholarship. YAE Camp 2018 was partially funded by a seed grant from the Open Meadows Foundation. In addition to sponsoring 3 schalorship spots, Killian Pacific provided the use of vacant space in Clay Creative for the camp. Ike's Tug & Supply (@kobrapaint_ikestugandsupply) donated all of the spray paint. Follow @YAECampPDX on Instagram and Facebook for updates! 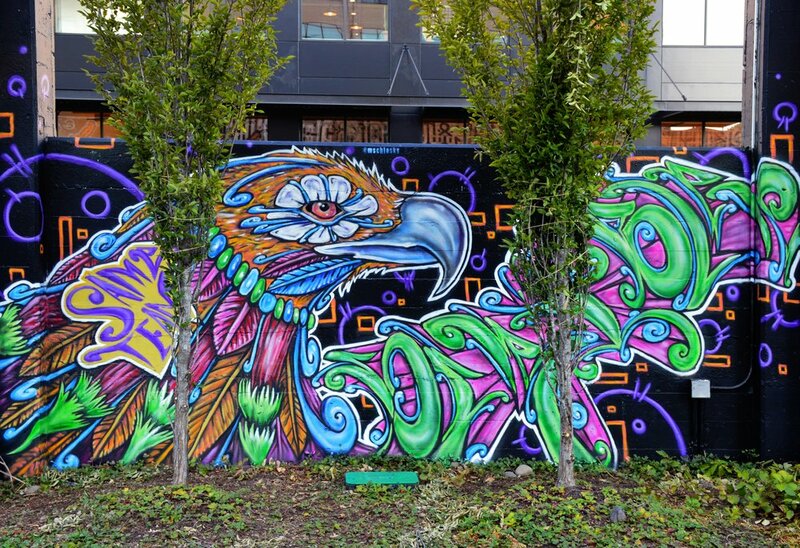 In 2017, Portland Street Art Alliance organized the painting of a new community mural at the corner of SE 30th & Belmont. This mural honors the rich history of the Sunnyside Neighborhood & Belmont District. The mural was sponsored by a grant from SE Uplift’s Small Community Grants Program, along with support from the Sunnyside Neighborhood Association, local businesses, and generous neighbors. This 100-foot long mural was designed and painted by emerging street artist, Mado Hues (@murky.mind), being their largest public art project to date. Each of the 10 panels represent significant pieces of Sunnyside history, such as its early rural and pioneer histories, its historic built environment, unique transportation history (being the first streetcar era neighborhood), iconic local landmarks, prominent businesses and sacred spaces, and its dynamic cultures of art and sustainability. Working closely with PSAA researchers, a local artist developed concept sketches for the panels that embodied symbols of the Sunnyside neighborhood's past and present. Explore the mural panels and some of the history of the Sunnyside neighborhood and Belmont Business District. PSAA donated all of their management time, and volunteers assisted with many aspects of the project, including wall prep, community outreach, and architectural detail painting. PSAA connected with the neighborhood via print and social media, on-the-ground flyers, and word-of-mouth. Some people just simply passed by the mural, and offered to lend a helping hand. Dozens of community members including children, teens, elders, and local houseless community contributed to mural project in some way. The original Belmont Mural was painted by muralist Jennifer “Jenny” Joyce and volunteer community members in September 1996. The mural was a result of the efforts of the AmeriCorps Members for Neighborhood Safety, a 1996 AmeriCorps Program. Artist, Jennifer Joyce, was sponsored by the Neighborhood Arts Program, Regional Arts & Culture Council. 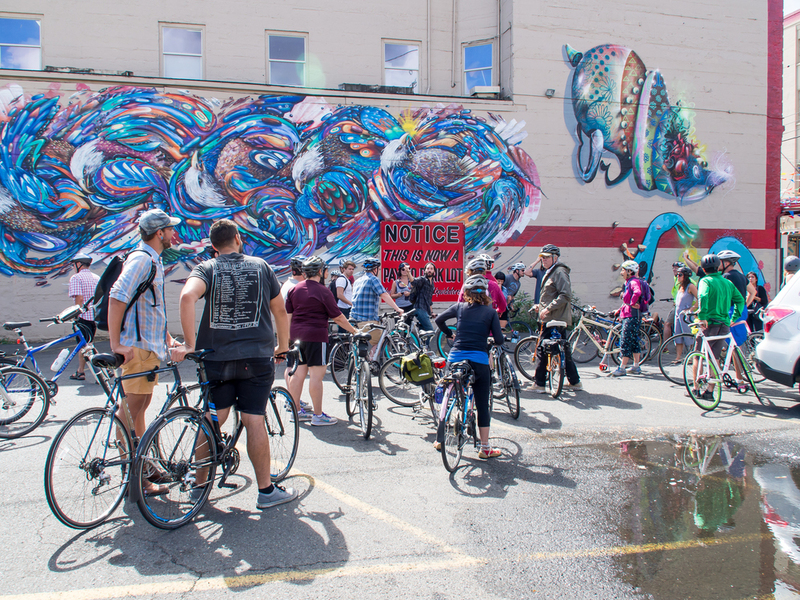 The mural was further supported by Multnomah County District Attorney's Office, Bitar Brothers Corp (the property owner), Graffiti Abatement Program, SE Uplift, Sunnyside Neighborhood Association, local schools, businesses, and neighbors. SOLVE also donated a lot of the paint that was used. This was a true community mural painting project with about 20 to 30 community members painting, including students, and several AmeriCorps volunteers, who also provided invaluable assistance with doing much of community outreach, organizing, and logistical work. Jennifer is a longtime fine artist and muralist, and designed the basic structure of the mural based on what she had learned about the area, and gathering input from people in the community. 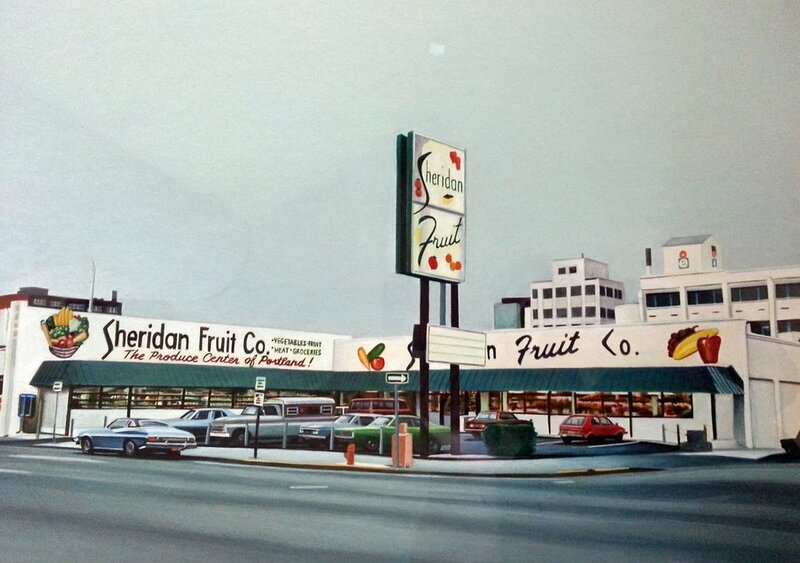 Jennifer also based the design for the original mural off the architecture of the building. In 2004, the Belmont Mural had been damaged by graffiti. 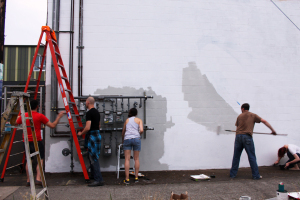 Jennifer and several community members in the Portland art community, including Joanne Oleksiak and Joe Cotter of the Portland Mural Defense restored the mural, which had to be thoroughly cleaned and repainted. Since the mid 1960's, Jennifer has painted all over Oregon, including murals in the Salem Hospital, schools, libraries, and several McMenamins, along with Portland's "grandfather of community art," the late Joe Cotter. Jennifer now lives in NE Portland. You can see some of her paintings at the Portland Art Museum's Gallery, McMenamins, and her murals in Estacada, OR. Jennifer has been working in collaboration with the Artback Artists Co-op for the past 25 years on Estacada murals. Each year, the Co-op has a different artist as the lead (Jennifer has lead the painting of three of those murals). We are thankful to have received Jennifer's blessing on the Keep on the Sunnyside Mural, and hope that the new art lives up to the last, and keeps its original spirit alive. 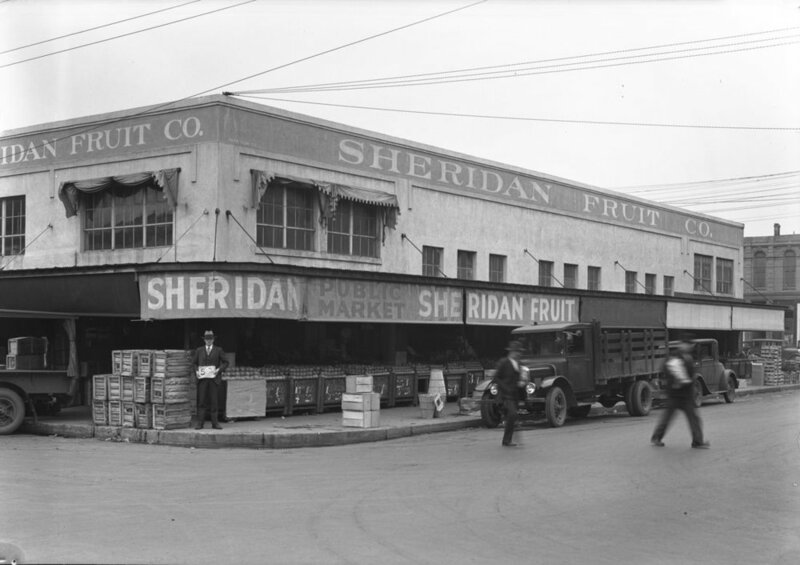 Combining research, photos, and archival materials, this interactive site allows you to explore the mural and history of the neighborhood. 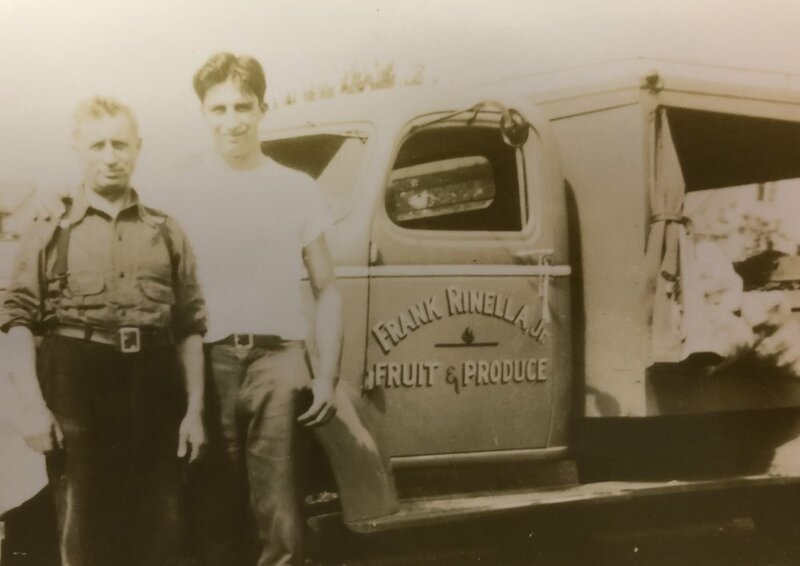 Explore more of Sunnyside's rich history, from pioneering legends to oral histories from everyday people who lived and worked in Sunnyside. Comb through archival photos of the places we cherish and recongize today, and remember and honor the history we have lost. Special thanks to the people, organizations who contributed and supported this project including the Oregon Historical Society, the City of Portland Archives at PSU and Historic Resources and Preservation Department, the Bosco-Milligan Foundation at the Architectural Heritage Center, and Carl Abbott at Portland State University's Urban Studies and Planning Department. Learn more about the annual Sunnyside Piazza Intersection Repair Project at SE 33rd & Yamhill. Since the year 2000, the community has come together to repaint this special intersection. It has become an important part of Sunnyside’s neighborhood identity and an icon of DIY Portland public art. This event is fully supported by volunteers, and funded by local residents and businesses. Have unique stories about Sunnyside or Belmont history, old neighborhood photos, or Artifacts? 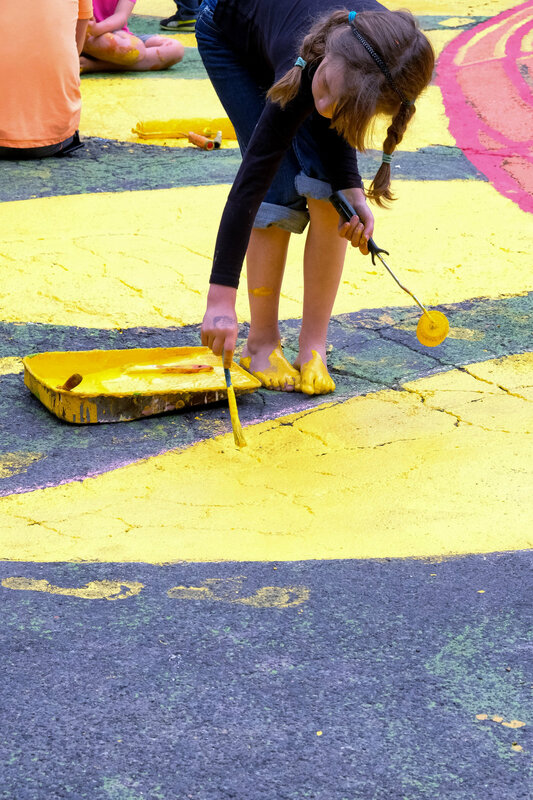 Want volunteer for the 2018 Sunnyside Piazza Repainting? Contact Us! 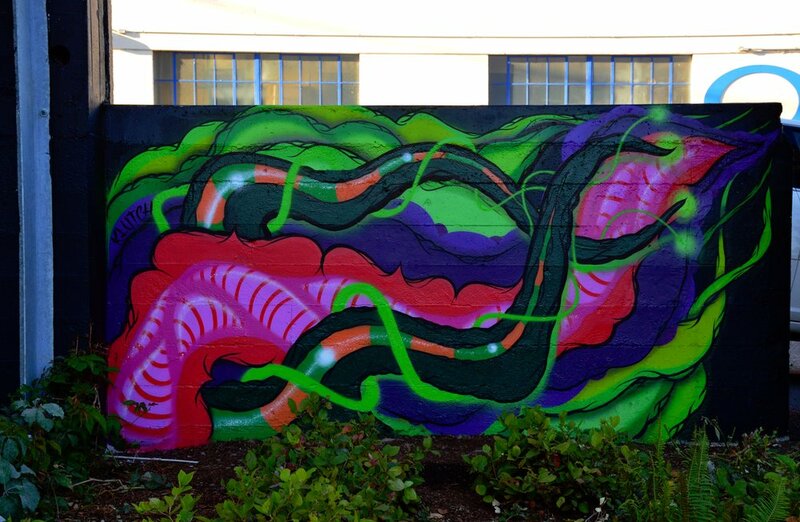 Introducing Portland Street Art Alliance’s new graffiti production, The Alexis Walls! After months of planning, we are thrilled to launch this unique and dynamic project. The Alexis Walls will showcase some of the finest and well-respected Pacific Northwest artistic talent, and provide the public with a curated rotating public art gallery. In this first round of murals, PSAA brought together local graffiti legends Kango, Joins, Giver, Spud, Rasko, Rite, Nekon, Ekose, Jade, and Eras. 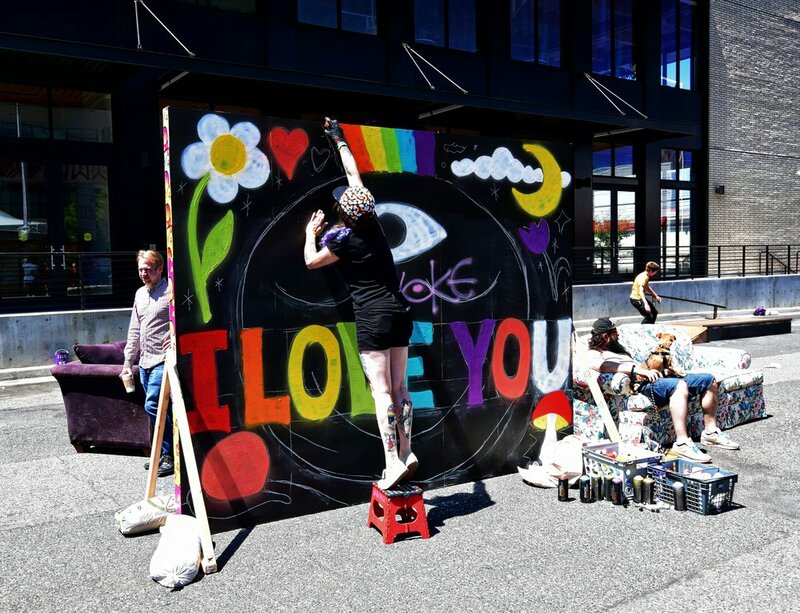 After just a few weeks of painting, the project has already sparked excitement in the arts community and buy-in from the larger SE industrial business community. 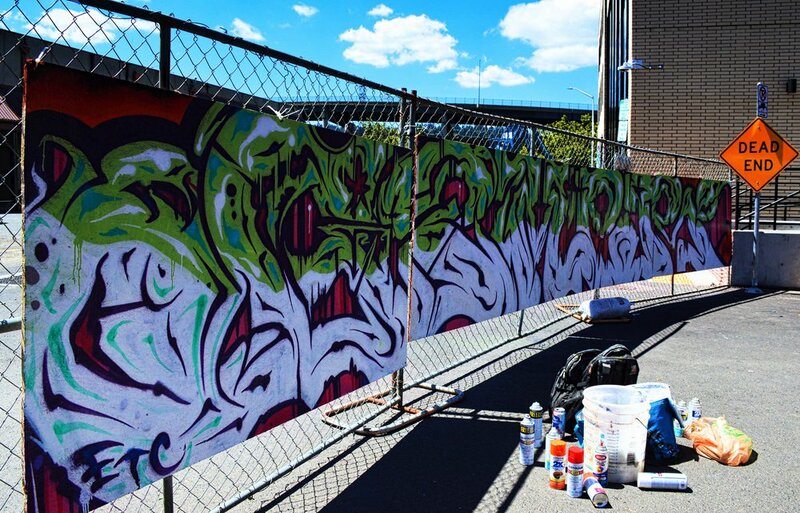 It’s not everyday the public gets to see such a display of graffiti-style art. It is our aim to show the larger community what is possible when artists are given the time, space, and means to produce quality work in this genre of art. Special thanks to the owners of Alexis Foods; who provided PSAA open access to their walls and a sizable donation to kick-off this project. 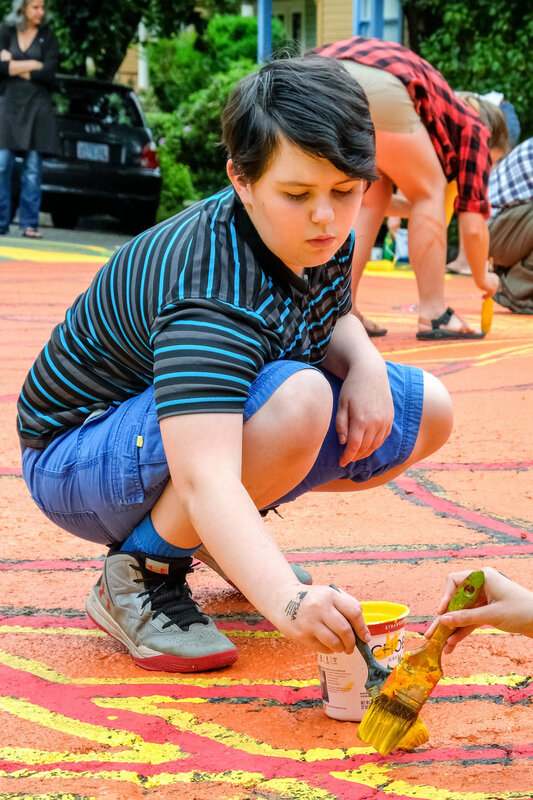 We are looking forward to bringing more communities together, securing new walls, and helping to sow the seeds of creativity and acceptance in the Central Eastside. The Art Fills the Void! project took place during the summer of 2015 and was sponsored by SE Uplift’s Small Neighborhood Grants Program. 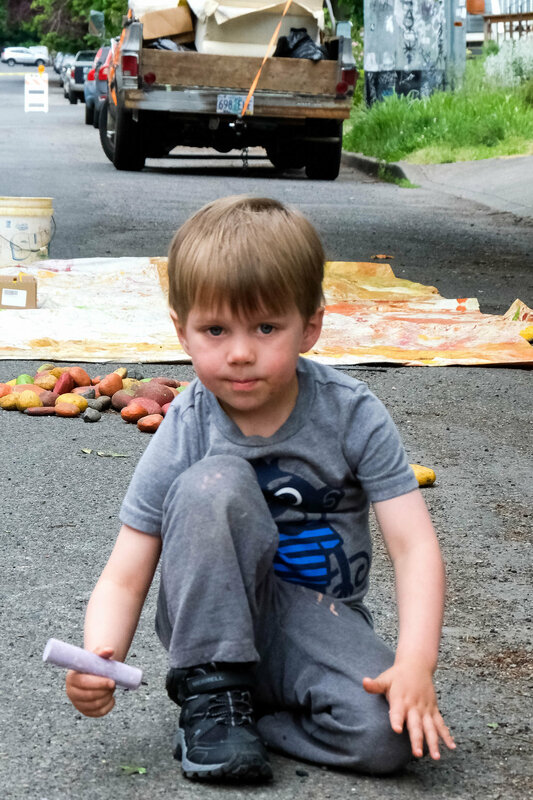 This project included several community outreach, education, and networking events, including a comprehensive map of street art in SE Portland, a interpretive bicycle tour, a street art of SE Portland brochure, and the revitalization of Portland’s oldest “gorilla graffiti,” the iconic Art Fills the Void! mural on SE 12th & Division. 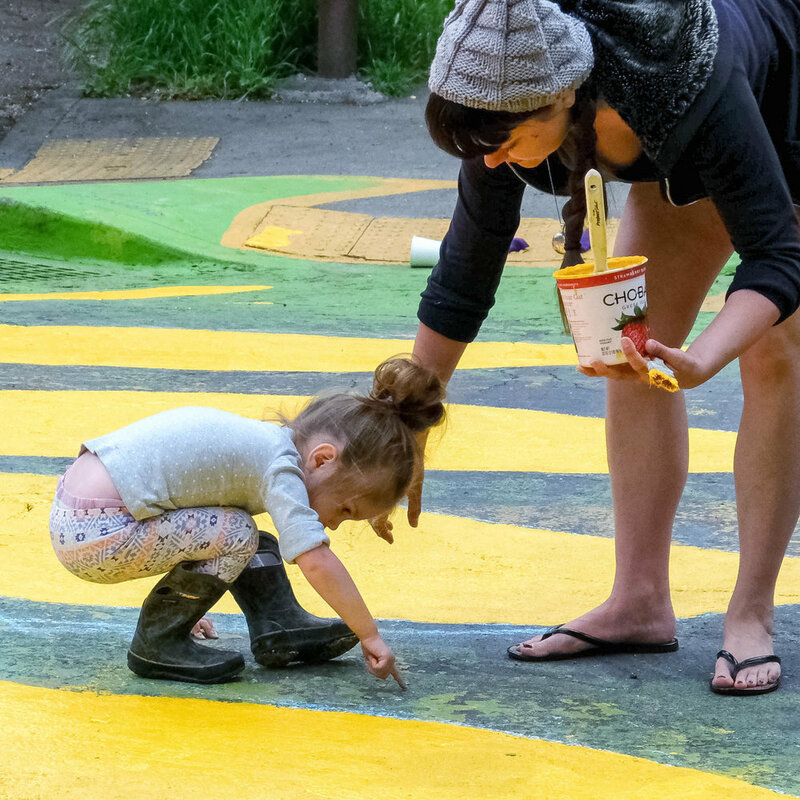 The goal of this project was to provide more community resources and opportunities that promote livability and art in the streets of SE Portland. These types of experiences not only increase the number and diversity of people engaged in and connected to their communities thereby promoting stronger cultural and historical identities, but they also empower people to become active leaders with the skills and inspiration needed to continue to shape and improve their shared public spaces in the future. The Art Fills the Void! 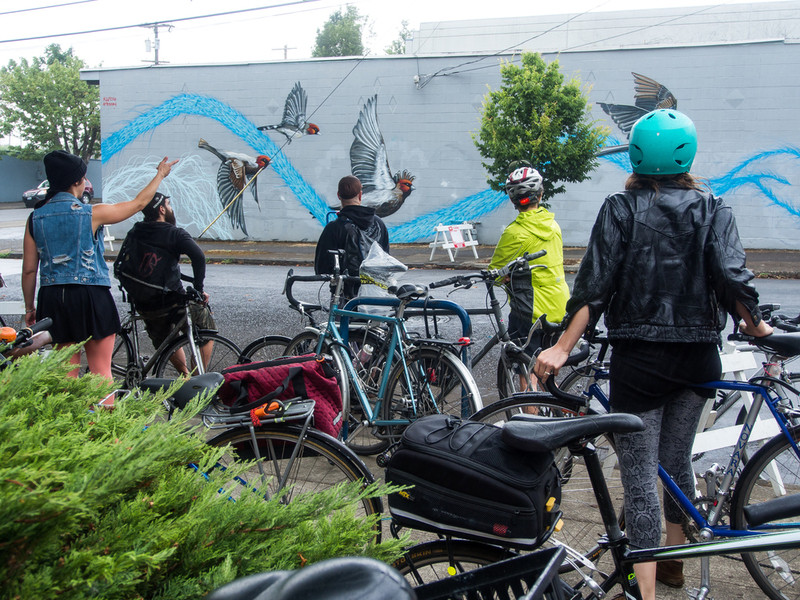 project provided a public interpretive bicycle tour of existing murals and street art installations in the SE Uplift area of Portland. PSAA tour guides provided descriptions, histories, and explanations of the artwork seen at each tour stop. PSAA tour guides provided a bicycle tour that provided descriptions, histories, and explanations of the artwork seen at each tour stop. 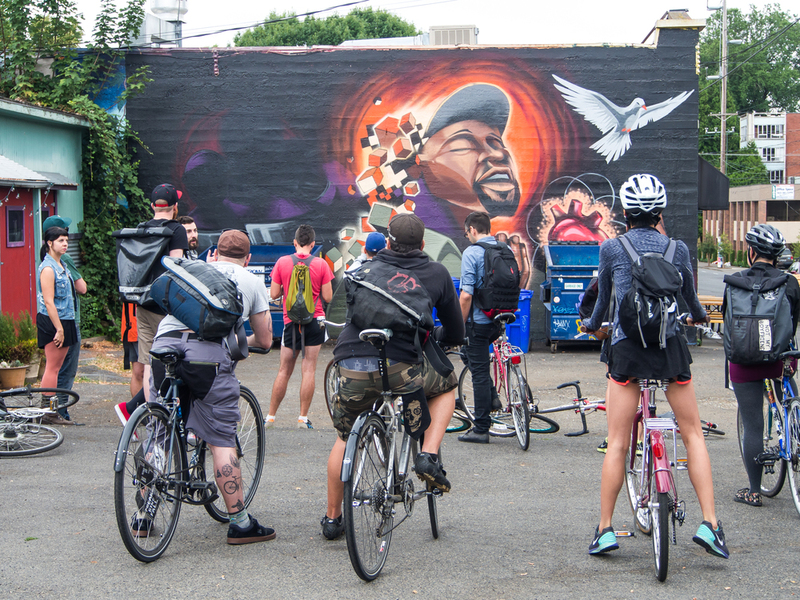 Several local artists, activists, and academics participated by being guest speakers a tour stops; talking about various topics they focus on and experiences they’ve had painting murals in Portland. Speakers included local artists Jon Stommel and The Lost Cause, who spoke about their experiences painting the Music Millennium mural in 2013 in collaboration with PSAA. Local artists Paige Wright and Lord Blakley who spoke about their experiences painting murals for the 2014 Forest for the Trees project. Representatives from the City of Portland including City Planner and mural permit program coordinator, Douglas Strickler and Regional Arts and Culture Council (RACC) Public Art Manager Peggy Kendellen provided overviews of both official systems for creating legal art in the streets. Other speakers included Gage Hamilton, director of Forest for the Trees, Kohel Haver a lawyer who specializes in artistic copyright law, and PSU geography professor Hunter Shobe whose research focus on the politics of public space, geographies of graffiti, and sense of place. Unfortunately the bicycle tour had to be cut short due to inclement weather (even for Portland standards!) so the rest of the group converged at Sweetpea Baking Company for good coffee and conversation. Take a self-guided tour, by following this BIKE ROUTE MAP! The Art Fills the Void! project also included the full historic restoration of the iconic Art Fills the Void mural, something that has not been done in decades. 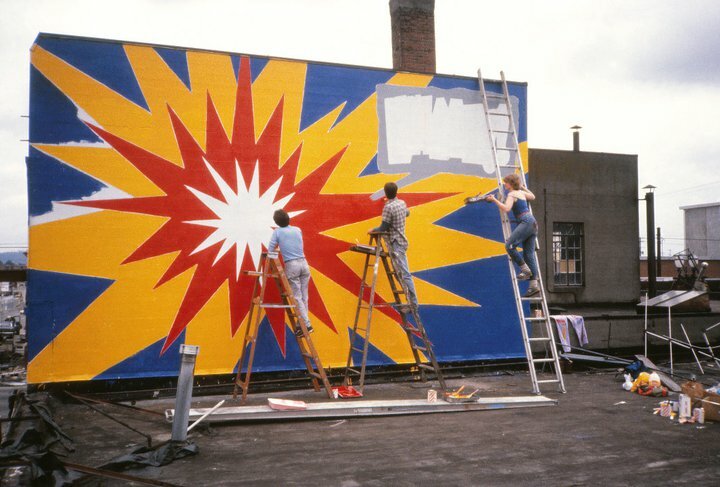 After decades of tagging, buffing, and haphazard touch-ups, PSAA connected with muralist and sign painter Frank DeSantis to obtain original photos, stencils, and schematics to be able to reproduce the mural true its 1982 form. The repainting took weeks of planning, 5 days to buff and repaint. This was all completely done with volunteer labor, organized by PSAA. 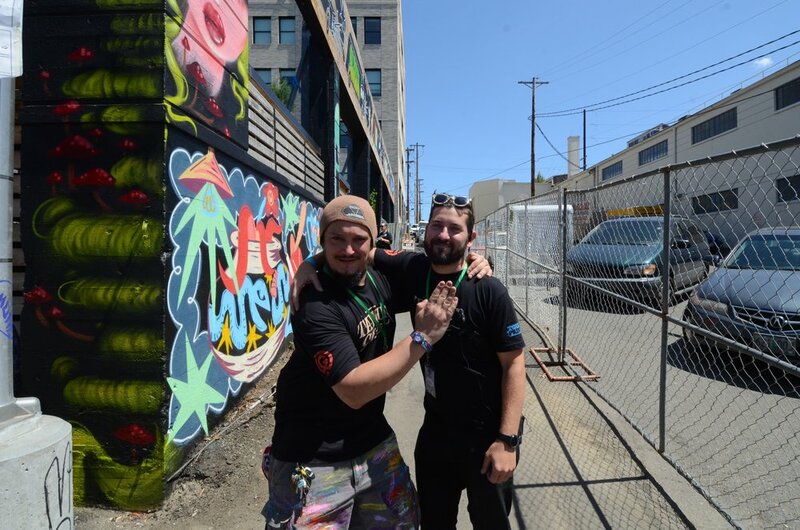 In addition to core PSAA volunteers, several local artists like Galen Malcolm, Jon Stommel and Travis Czekalski (Rather Severe) donated their time and expertise to paint the mural details. Additionally, several banana mural neighbors, mainly Joel and Mary Schroeder, provided invaluable assistance, coming out to help on multiple days, storing ladders, and helping PSAA manage on-the-ground logistics. Restoring this mural was truly a community achievement, through and through. Everyone passing by had great things to say about the mural, recounting their experiences with it throughout the years and how wonderful it was to see it being restored. Local business employees came out on their breaks to watch us paint and chat about the project. Passing cars honked, bicyclists rang their bells, and every two hours we got a tipsy applause from the bar-hopping group bicycle tour, Pedalounge. These types of experiences not only increase the number and diversity of people engaged in and connected to their communities thereby promoting stronger cultural and historical identities, but they also empower people to become active leaders with the skills and inspiration needed to continue to shape and improve their shared public spaces in the future. PSAA was proud to be able to restore this piece of Portland history for generations to come. 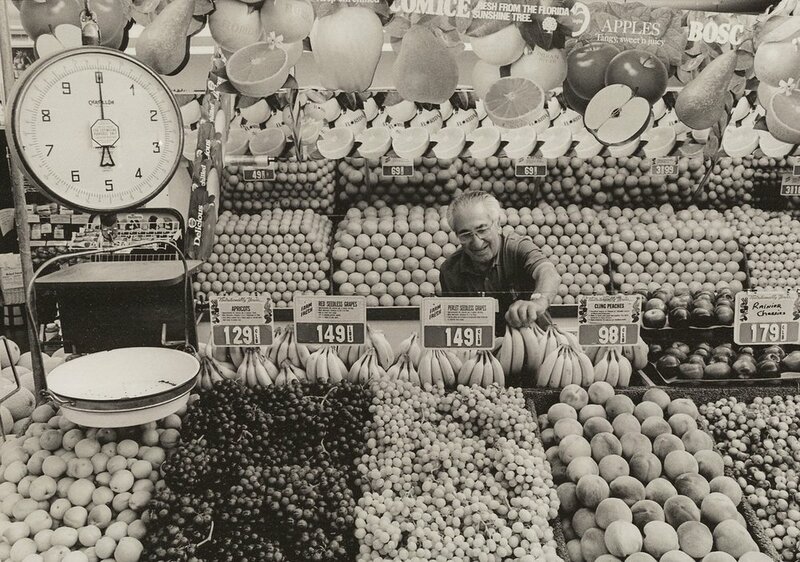 CONTINUED MURAL RESTORATION & PRESERVATION HELP NEEDED Want to help keep the banana fresh?! PSAA is asking for doantions to help support covering the additional costs of the discounted protective anti-graffiti clear coating ($300) and continued maintenance of the mural. PSAA is also hoping to one day raise $200 so we can have a bronze historical plaque cast and adhered to the wall, describing the historical importance of the Art Fills the Void! mural. Please consider donating to this important community effort via the project’s on-going GoFundMe. All donations are tax-deductible, please email us for details. Part of the Art Fills the Void! project was to create a comprehensive MAP SE PORTLAND STREET ART. This map is a snap shot of permission street art during the Summer of 2015. Since art on the streets is always changing, with old murals being lost and new ones painted all the time, we look to the community to notify us of new or lost art. 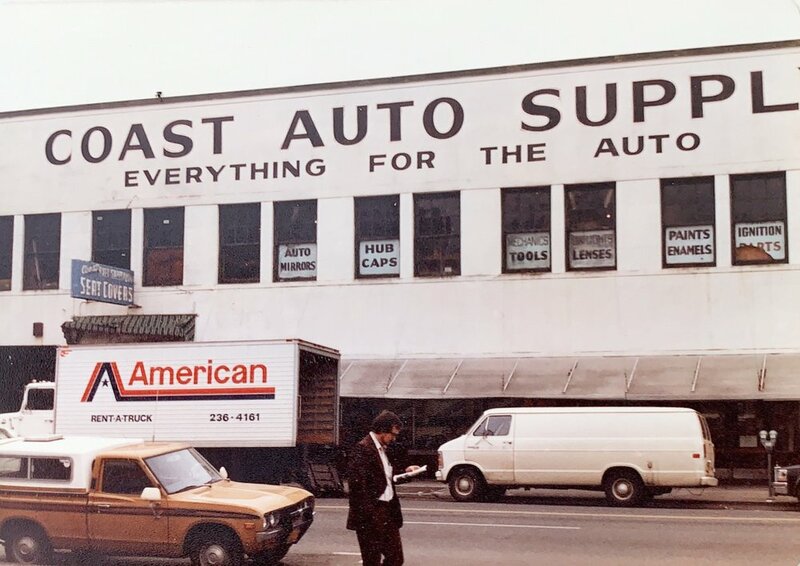 With its abundant low-lying commercial buildings, ample wall space, and eccentric quirkiness, Portland Oregon had a unique mural arts scene in the 1980s. In 1982,Gorilla Wallflare formed. 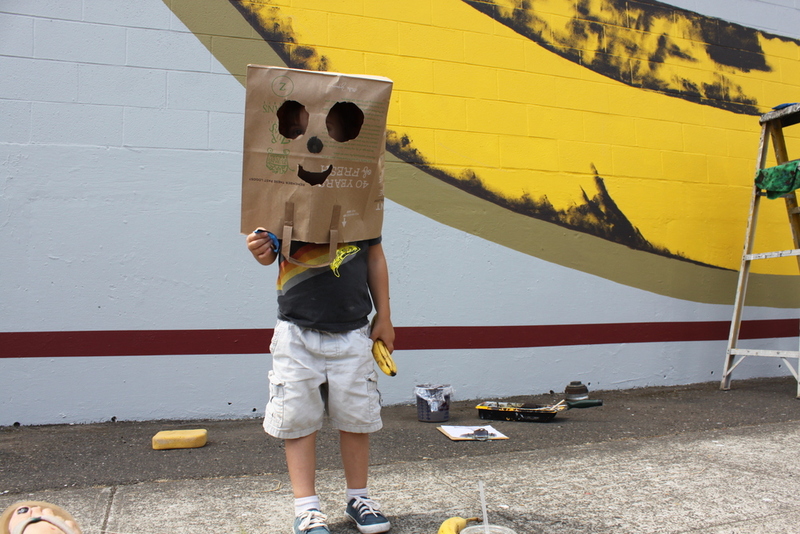 It was one of Portland’s first anonymous “graffiti” art crews. This small group of citizens brought some much needed color and excitement to Portland dull walls, all undercover, and without permission. 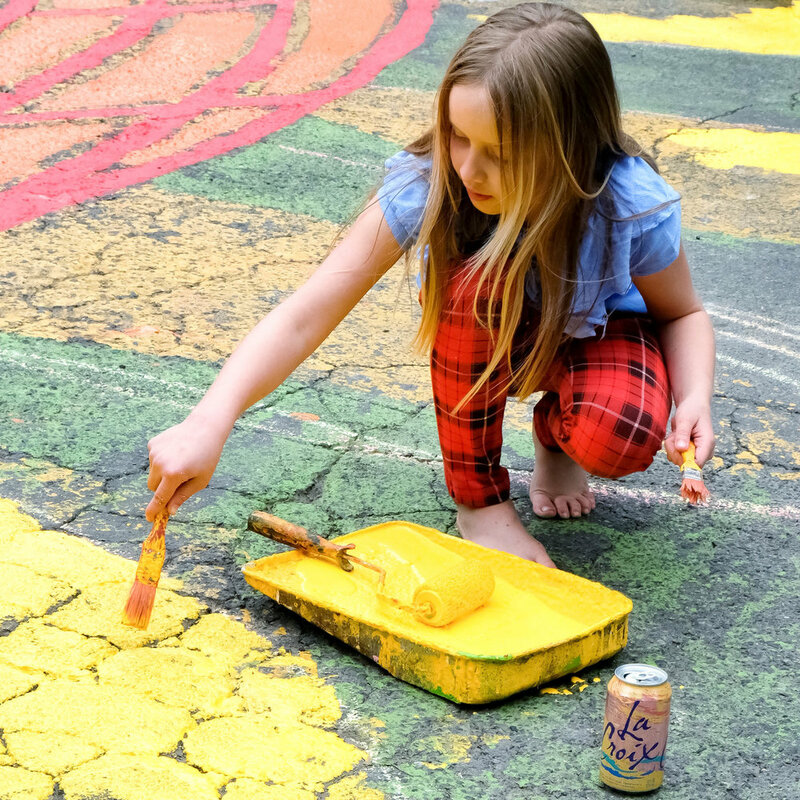 They called them “painted landmarks, political statements, graffiti, and spoofs.” After painting each of their three Portland murals, they sent a type-written letter to city officials and news outlets telling them about their actions and motivations. Gorilla Wallflare’s first “attack” was their Art Fills the Void! 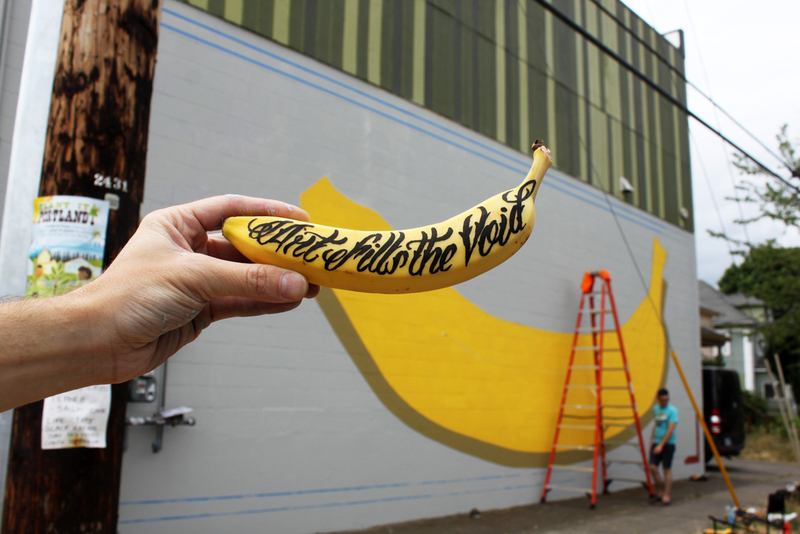 banana mural at the corner of SE 12th and Division. 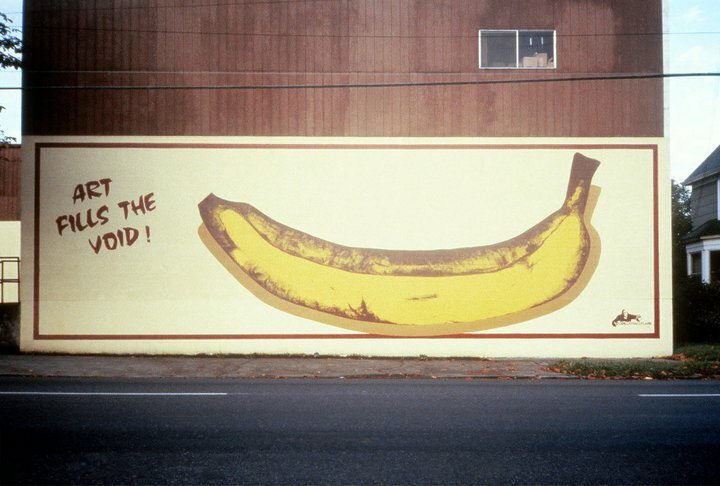 This large 30 by 50 foot painting of a bruised banana may look like a reference to Andy Warhol, but a member of Gorilla Wallflare has said that it was originally about the war in Central America, a banana republic, “Viva mi banana! The group later decided to change the wall’s exclamation to “Art Fills the Void,” as a protest to the existence of such a boring blank wall. Art Fills the Void! is the oldest mural in Portland. Predating even the 1984 Black Pride Malcolm X Mural (Read more about that mural here). It is also a rare example 80s murals in Portland. 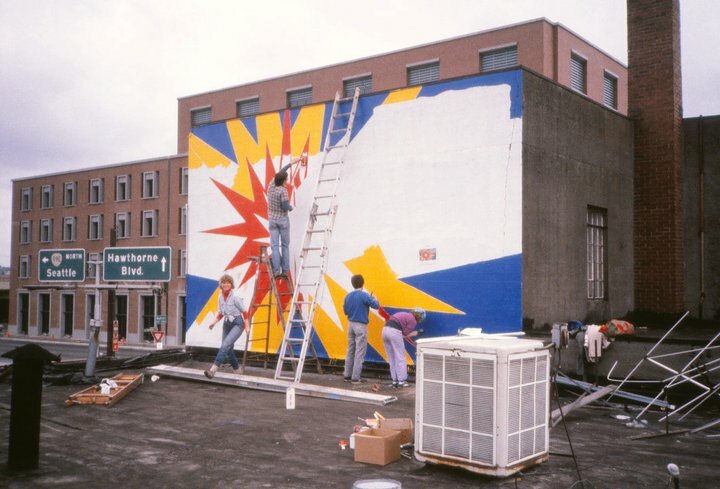 Many old community murals in Portland were lost between 1998 and 2005, during the lengthy legal battle between the City of Portland and AK Media (now Clear Channel) over signage rights. This local landmark is centrally positioned on the corner of SE 12th and Division. Once a quiet and somewhat seedy and abandoned part of town, this is now one of Portland’s most quickly gentrifying and developing neighborhoods, being cooked up by Portland’s sizzling food scene. The Art Fills the Void! mural shows how communities can embrace a piece of illegal graffiti, and over time come to appreciate and embrace it. With or without permission, this piece of “graffiti” has lasted decades, and now holds a special place in Portland’s urban landscape and social consciousness. Tell us a little about Gorilla Wallflare, and what made you form the group? There were about 5 of us who actually painted the murals. Of that, 4 were professional artists. But we had lots of honorary members. 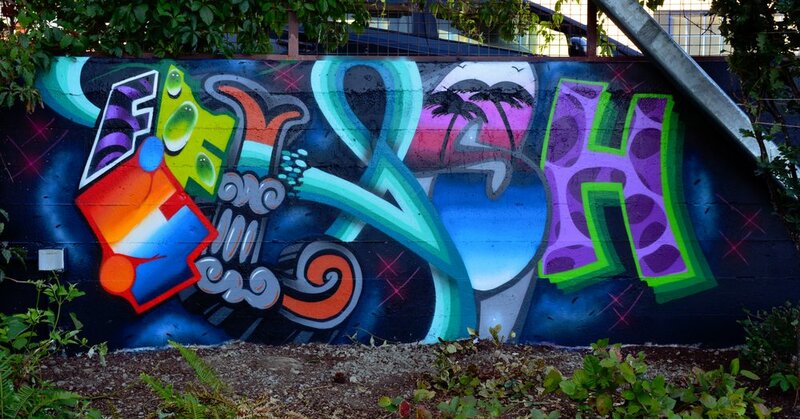 We were inspired by graffiti artists, just get out there and doing something about it. Artistic inspirations came from Calder, Lichtenstein, Warhol, Dali, Duchamp, Matisse, Man Ray, and a group called the Art Squad out of Canada. Willamette Week called you Portland’s “underground graffiti gang,” did you see what you were doing as “graffiti” as we think of it today? Although I saw it as graffiti, I wanted it to be something different. We waved to authorities while we painted in broad daylight, sometimes taking all day to complete the project. Naïve, maybe, but there was definitely an adrenalin rush in being clandestine and brazen at the same time. I remember liking that, but didn’t care for using the words “underground” or “graffiti” at the time. Other than Art Fills the Void! did Gorilla Wallflare paint any other guerilla murals in Portland? 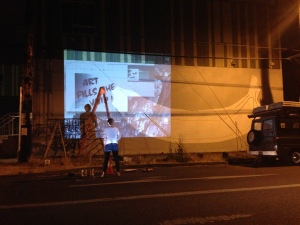 We painted three murals – “Art Fills the Void,” ‘Oh No!” on the Hawthorne Bridge, and the “Fingerprint” on SE Belmont. What were these other murals about? 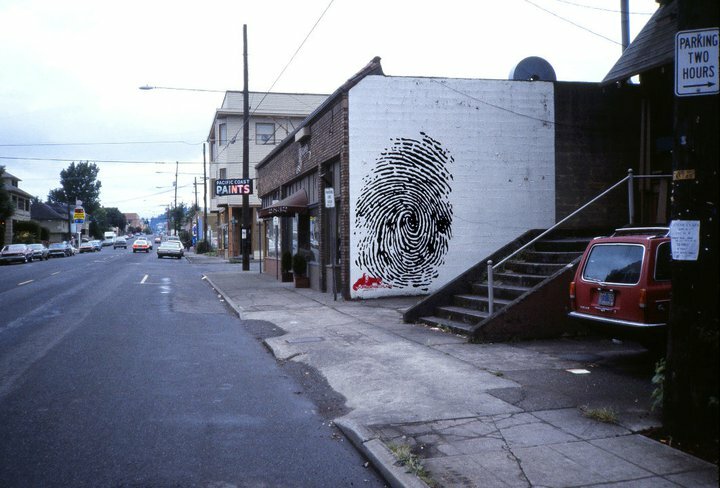 The Fingerprint mural on Belmont was a subtle message about privacy and the rights of the individual. It felt as if soon everyone would be followed and watched. The Oh, No! explosion, on the east end of the Hawthorne Bridge, was about the end of the world, then in 1984, just a few years away. 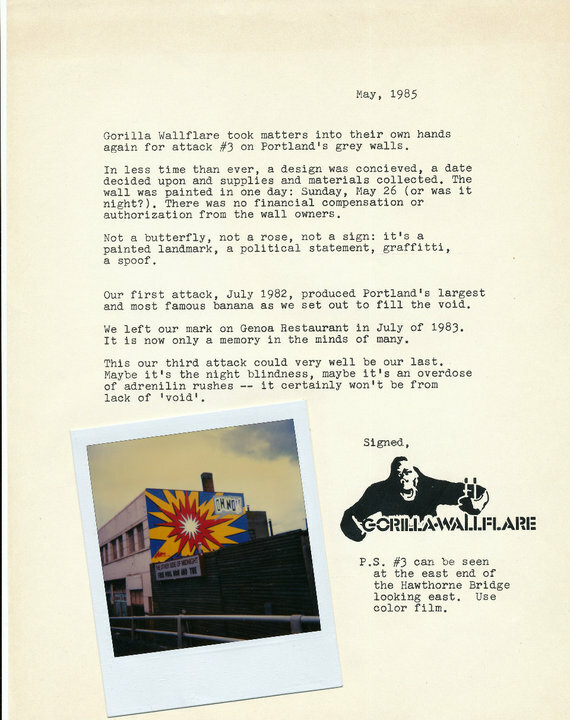 Why did Gorilla Wallflare send letters to the press about the murals? The letter was fun to write, and a great public relations gag. How else can you get a half page of free public relations and advertising in The Oregonian newspaper? What were the reactions to you guys out there painting these murals in broad daylight without any permission? We wore painter’s pants, hats, and had official-looking ladders. We usually painted on Sundays. At the time, there were no sign inspectors or mural regulations. This was also the worn, torn, and tattered Eastside; people just didn’t notice of a couple of painters painting the wall. We had one person stop at the banana painting, a small Asian man carrying grocery bags. He looked up at us on the ladders and said, “Oh, that’s enough food to feed my family all week.” He laughed and kept waking. A police car drove by once and just kept on going. 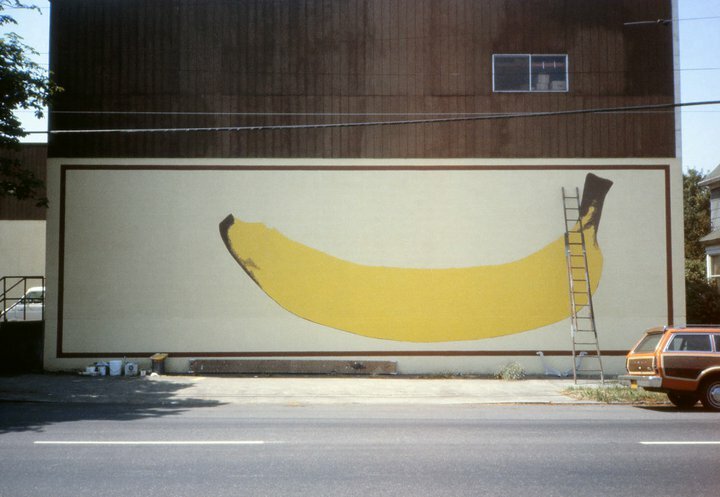 The owner of the office supplies store where the banana was painted was surprised by the new art, but they liked it. They actually incorporated it into their marketing campaigns. Did you find that your antics generated any discussion in the city? Some discussion, I’m sure, but in circles I wasn’t privy to in Portland. The city’s mural program did loosen up some a year or two later, or so it seemed. We really weren’t interested in the legal aspects. We were a guerilla operation; in and out. It was about free speech. We had more of an affinity towards graffiti, than the stodgy mural scene. Gorilla Wallflare painted their murals before the City of Portland had to enact mural and sign permitting regulations we have today. How do you feel about that shift, how the city handles now handles public murals? Who’s to say who can approve or not approve art? I’m not that knowledge about these mural waivers and permits, but I do know about sign codes and permits. Those I understand, but why regulate murals? They are artistic community ventures. We went through all that rigmarole for other murals. It was too much bureaucracy. Too much of being a “suit.” By the time we got through it, we were bored with the whole thing and could care less. The initial creative thought and energy were lost. Better to beg for forgiveness, than ask for permission. For more information and news on Gorilla Wallflare, visit them on their Facebook page. 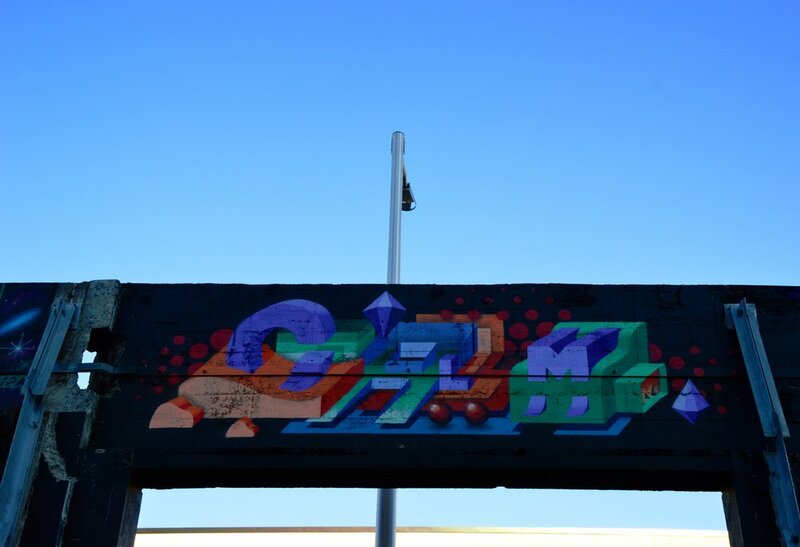 In September 2014, representatives from Portland Street Art Alliance (PSAA), Endless Canvas (Bay Area, CA) and Graffiti Defense Coalition (GDC) (Seattle, WA) participated in a panel discussion exploring the use of graffiti as a tool for communication and activism. The event was held at the University of Oregon in Portland, as part of the Cascade Media Convergence, a three-day long regional gathering of community-based media organizations, journalists, and artists. The panel discussion focused on what activism graffiti is, how it can be an effective tactic, how it’s spatial and social contexts affect its message and impact, and how city municipalities and corporations have responded to these types of actions. The panelists were first asked how they define “graffiti” for the purposes of the discussion. Although each panelist’s definition differed, consensus was that graffiti should be framed both legally and culturally. Legally speaking, graffiti is any marking text, or imagery that’s done in public (private property or public city-owned space) without permission. One type of illegal marking, is activist graffiti, which aims to communicate a dissenting message to the larger public. It was noted by panelists that all of these definitions are fluid and not universal. What is, or is not, considered graffiti greatly depends on the cultural, spatial, and legal contexts within which it is created and viewed. The panelists then discussed how graffiti exercises our rights to free speech and expression. Panelists felt that graffiti is a highly autonomous and democratic mode of communication. Because it occurs in public, graffiti is a way for a wide range of people that might not typically interact with one another, to freely and directly communicate with one another. The anonymity acts as a mask, protecting people from being prosecuted (unless caught) and encourages honesty and harsh criticism. Endless Canvas representatives pointed out that graffiti is an accessible medium for anyone, no matter what their socio-economic status is. Everyone can, at least in theory, create graffiti in public space. In so doing, graffiti can give value and power to under-served parts of society because it’s a way to insert their voice and presence into spaces where they’re otherwise not welcomed or allowed. Graffiti also challenges so-called “free speech zones,” acting outside of these regulated spaces and pushing the boundaries of what is done and tolerated in public space. Next, panelists provided examples of how graffiti has been used as a tactic for activism and direct action. Protest graffiti has been used in countless social movements throughout history. Recent examples can been seen in the Occupy, Egyptian, and Greek uprisings of 2011, the 2006 Oaxaca, Mexico protests, and the 2014 anti-World Cup graffiti in Brazil. Today, the multiplying power of social media technologies can amplify the reach of these social and political commentaries. Therefore, these types of unregulated communications can have an immense amount of potential power that governments fear. Governments have been known to shut down telecommunications during political uprisings (for example, in Venezuela, Ukraine, and Egypt). Oakland, BART shut down all underground cell phone service to try to prevent large protests. In some cases, graffiti is one of the only ways people can communicate dissenting messages to the public. Also discussed was how graffiti is often used to protest the “visual pollution” of corporate advertising. One of the most interesting cases presented was how Bay Area graffiti writers concentrated their interventions on certain billboard advertisements. These pieces tended to last longer on billboards than other spaces in the city because they were in hard-to-reach spaces, which proved to be difficult for the billboard company to remove. The owners eventually found these billboards to be a lost cause and were decommissioned due to unprofitability. Though the graffiti writers were unconsciously making a political statement, other guerilla artists found that these tactics were a powerful way for average people to fight against corporate advertisements in public space. It was also pointed out by one panelist that after the AK Media (now Clear Channel) vs. City of Portland case of 2005, painting murals without official city permission in Portland was (and still could be) seen as a form of protest. 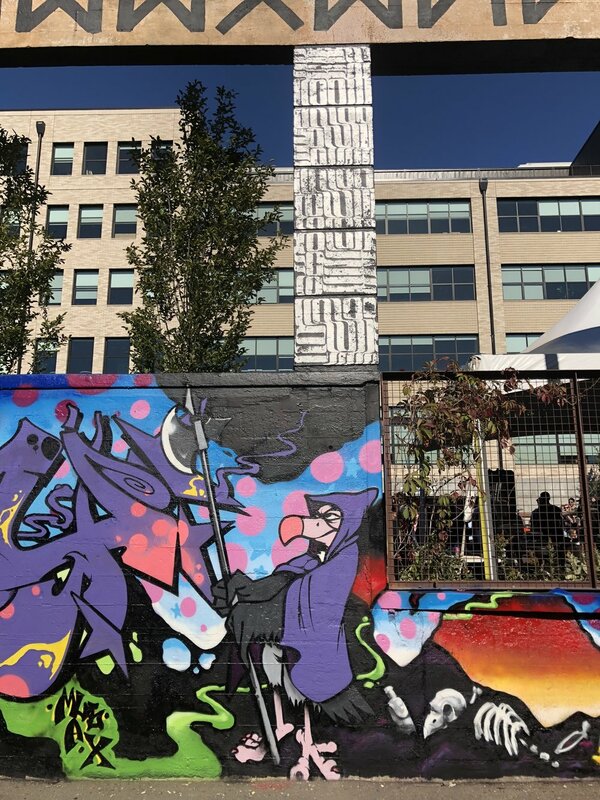 Today, all murals that are done without a permit or RACC waiver can be reported as “illegal graffiti,” fined, and forcefully removed by the city (regardless of whether or not the property owner consents). Panelists were then asked how permitted activist art differs from un-permitted activist graffiti. Anti-GMO mural in Oakland by Pancho Peskador and Desi W.O.M.E, April 2012. On one hand, panelists saw both legal and illegal activist art as two different strategies that can work simultaneously. Both forms can communicate powerful messages to the public though political commentary, making an impact on civic consciousness. On the other hand, panelists also pointed out that it is impossible to radically change the system by working within it. Some believe illegal activist art is a much blunter weapon that maintains maximum power and impact. With illegal art, there is no censorship. It is not mediated through the framework of capitalism or the state and the risks artists take to trespass and produce their artwork illegally infuses their art with intrinsic symbolic power. Lastly, panelists were asked to think about the public’s reactions to graffiti and how it alters our perceptions of space in the city. A Graffiti Defense Coalition representative gave the example of New York City in the late 1970s when many young people saw graffiti as a creative way to bring much needed color to the crumbling and decaying city, exciting the urban landscapes around them. Amidst this political and infrastructural chaos, authorities and the media began to campaign against graffiti, associating it with dirt, decay, disease, and madness. These anti-graffiti campaigns cited the “broken windows theory” as their basis, arguing that minor misdemeanors (like graffiti) must be stopped or there will be an atmosphere of lawlessness that will attract serious criminal offenders who will assume that residents don’t care about the neighborhood. By promoting a culture of unrealistic fears, and tapping into the public’s moral insecurities, authorities were able to justify increased policing and regulations of our public spaces. Policing ideologies like this did nothing to address the longstanding social inequalities, infrastructural neglect, purposeful arson-for-profit scams, and declining tax revenues that were causing urban decline at this time. Today, it’s clear to see that graffiti is often actually a sign of a vibrant urban area, or one that’s in the early stages of gentrification (Berlin, Bushwick, and Miami, etc). Portland Street Art Alliance members then pointed out that dominant ideologies define what is, and is not appropriate in public spaces. In the case of graffiti, the public was told by city-sponsored anti-graffiti ads and public announcements that they should prevent graffiti at all costs, that it didn’t belong in the city, and will cause a spiral of decay like is seen in extremely neglected and ignored urban neighborhoods, like the South Bronx in the 1970s and 80s. Subsequently, the tide of fear and criticism against graffiti rolled in. 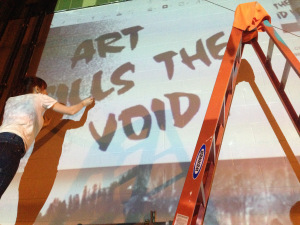 Representatives of Endless Canvas echoed the sentiment, stating that graffiti doesn’t actually physically hurt anyone, and the battle between the city and graffiti artists, is a sign of a much larger battle for control, voice, and representation. Graffiti is considered a major urban problem because it challenges the notion of private property, and by extension, the entire system in which modern society is built upon. It also makes us think about who really does or should have control of our public visual space. It is symbolic of a much larger struggle for our collective rights to the city. Special thanks to Brett Peters for helping to write this article and CMC organizers, particularly Tim Rice, for supporting and making this regional discussion possible.